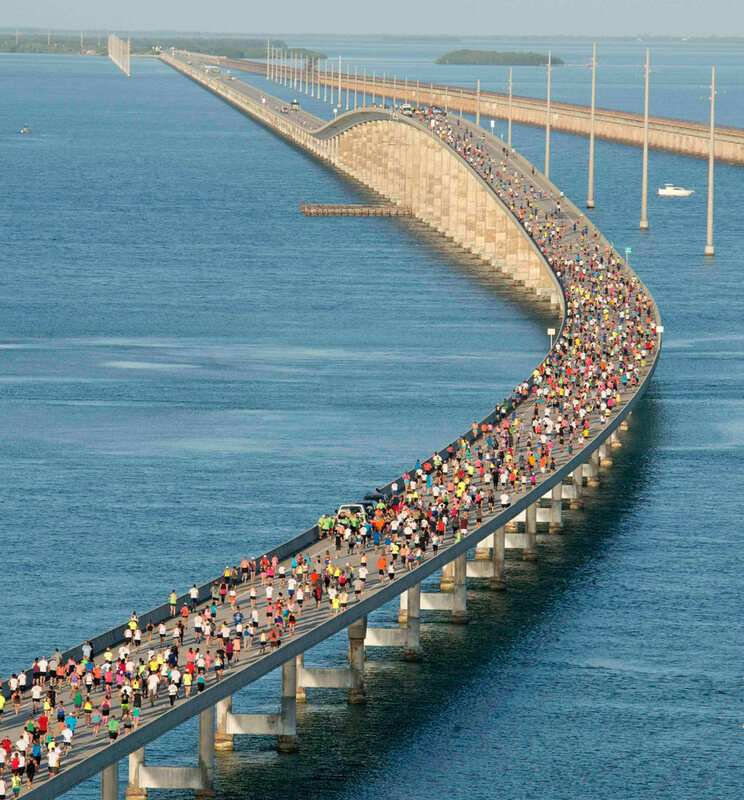 A bridge usually gets people to the other side safely. 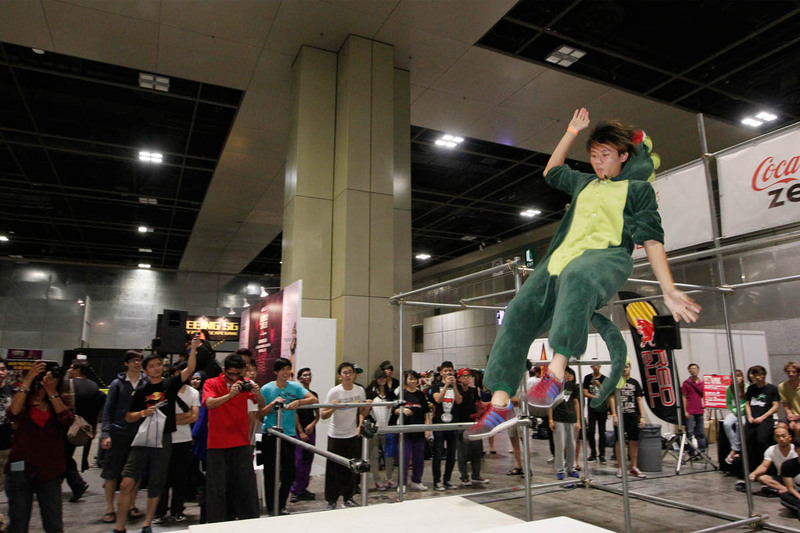 But not for some people - and even animals - who have to do balancing acts as they make their way to safety. 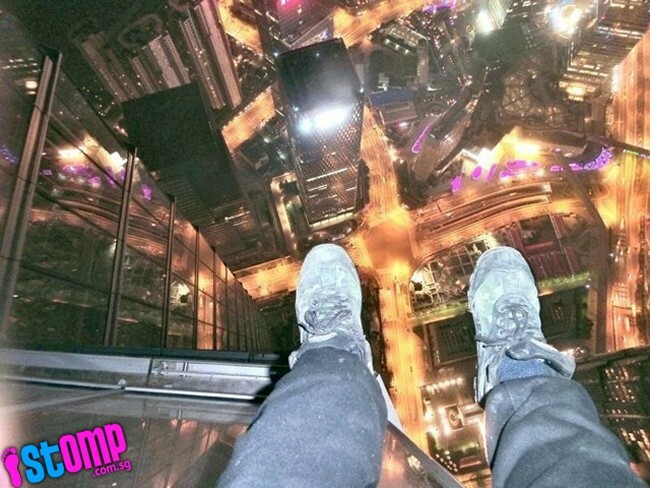 Dangerous crossings are definitely not for the faint-hearted or those suffering from vertigo. 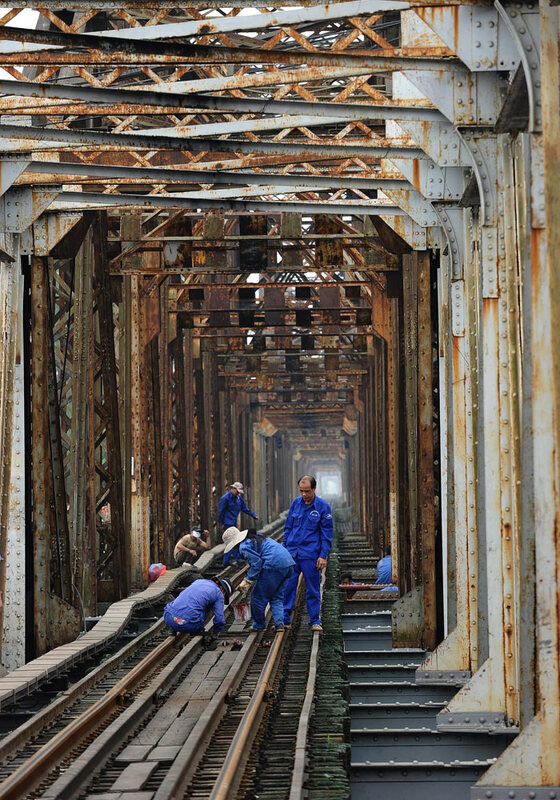 Especially in places where bridges are rickety-old and worn out, and in need of urgent fixing or demolition. 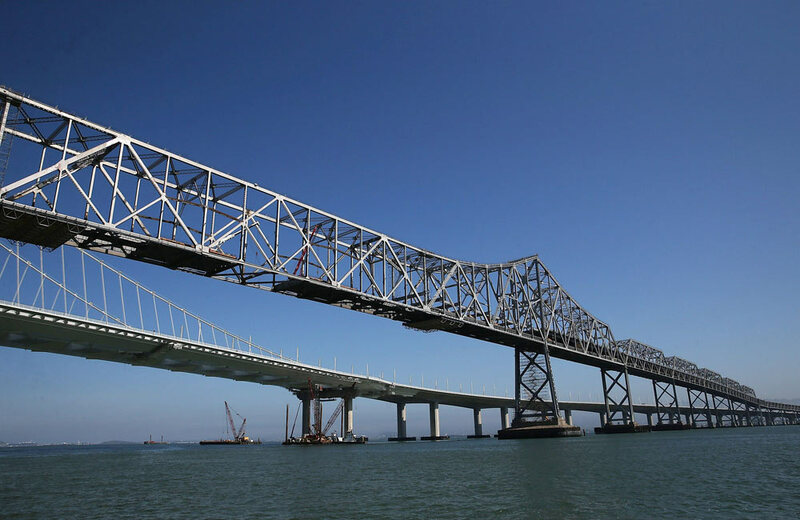 Like the old San Francisco-Oakland Bay Bridge, which is being taken down in stages. 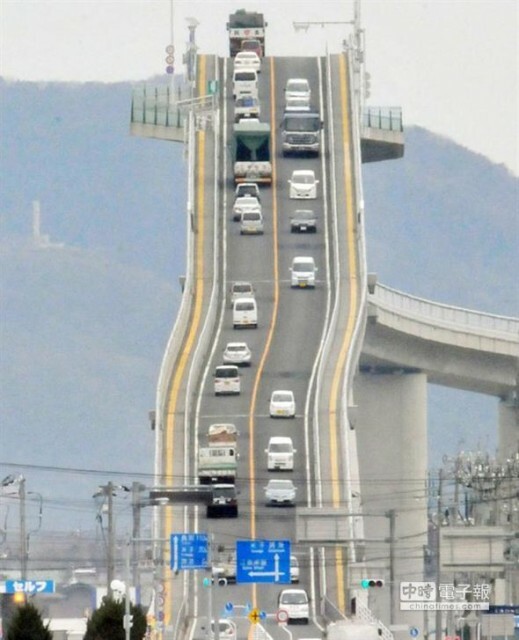 At some connecting spots like a steep vehicle bridge in Ejima in Japan, motorists have to muster full control as they steer their cars especially when they go downhill. 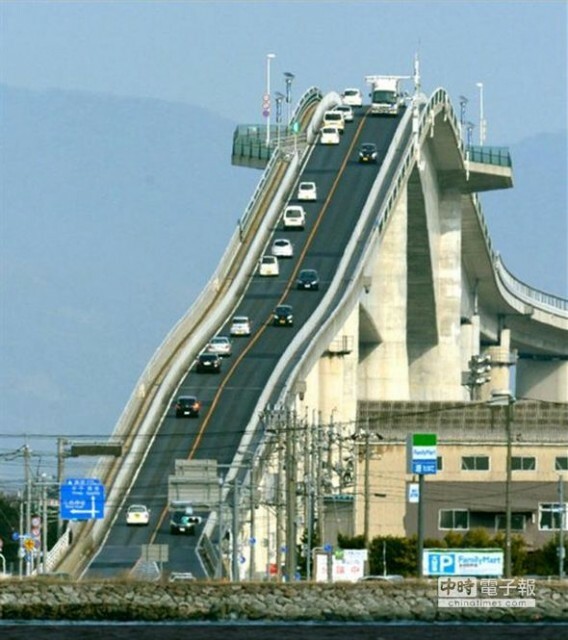 Otherwise a nasty pile-up might result. 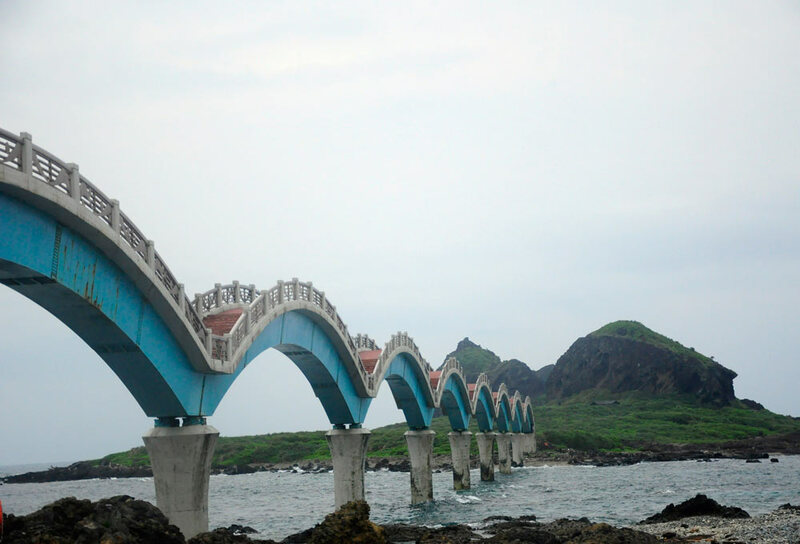 But many bridges have been engineered and designed with international standards of safety. 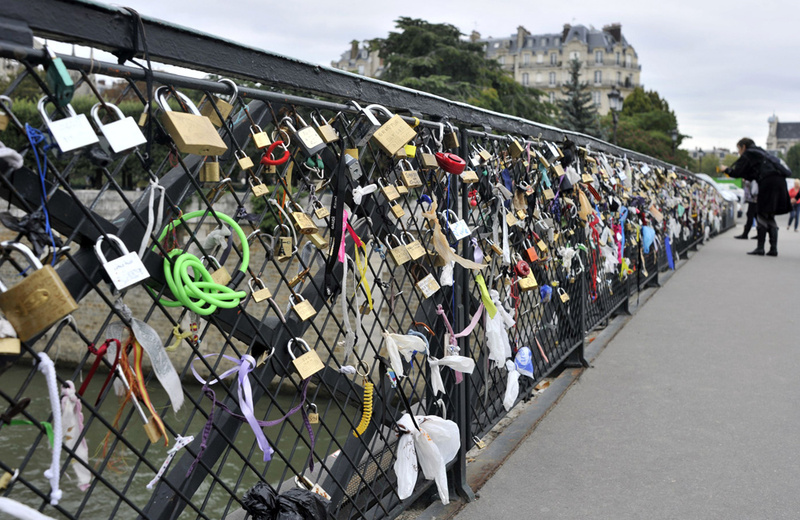 And they look beyond mere solid structures of function. 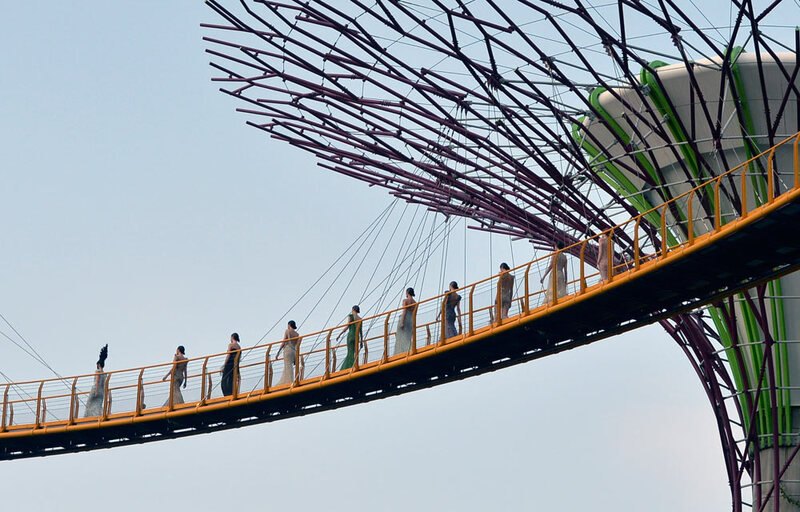 The ones with new-fangled designs include the illuminated double-helix bridge at Singapore's Marina Bay and skywalk at Gardens By The Bay - which was used as an elevated catwalk in the air for a fashion show. 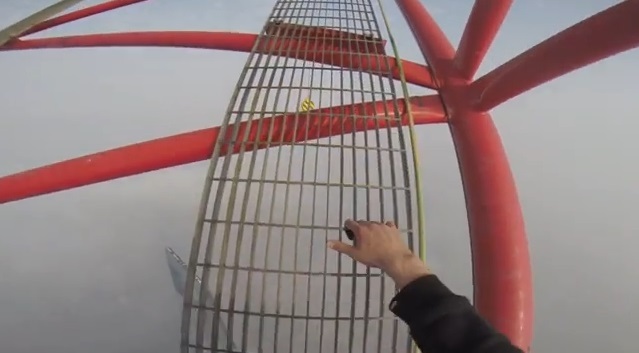 Who says a bridge can't be cool? 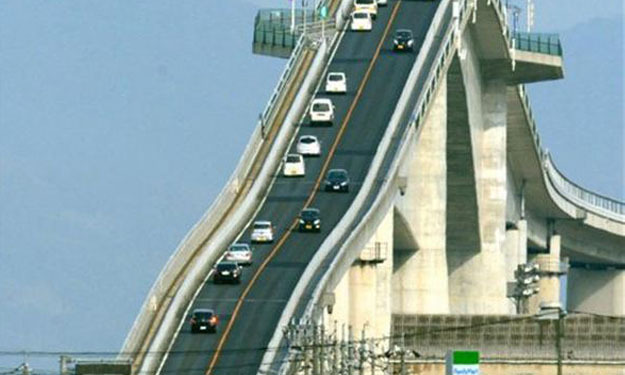 The Ejima bridge in Matsue city in Japan is so steep that driving on it has been likened to riding a roller-coaster ride. 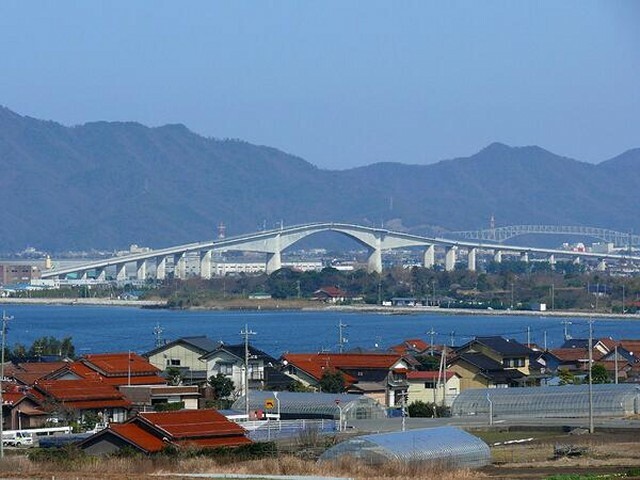 From side-view and a good distance away, Ejima bridge doesn't look as challenging. 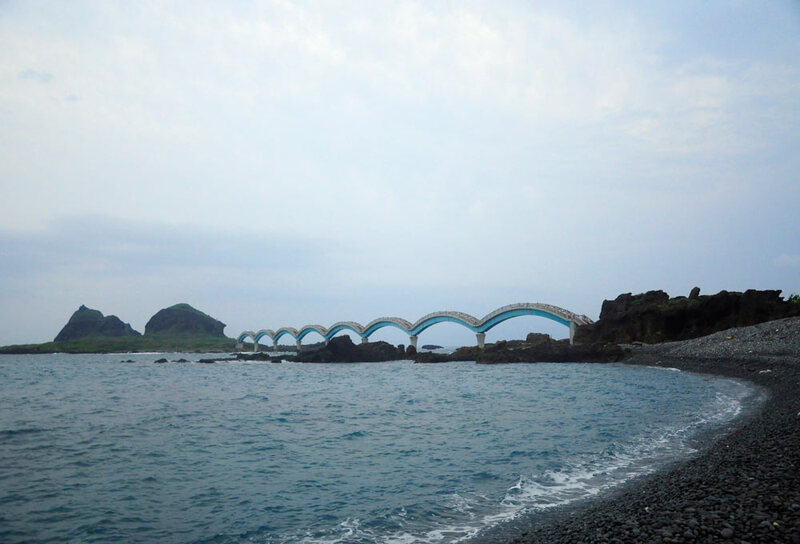 San Xian Tai eight-arch bridge. 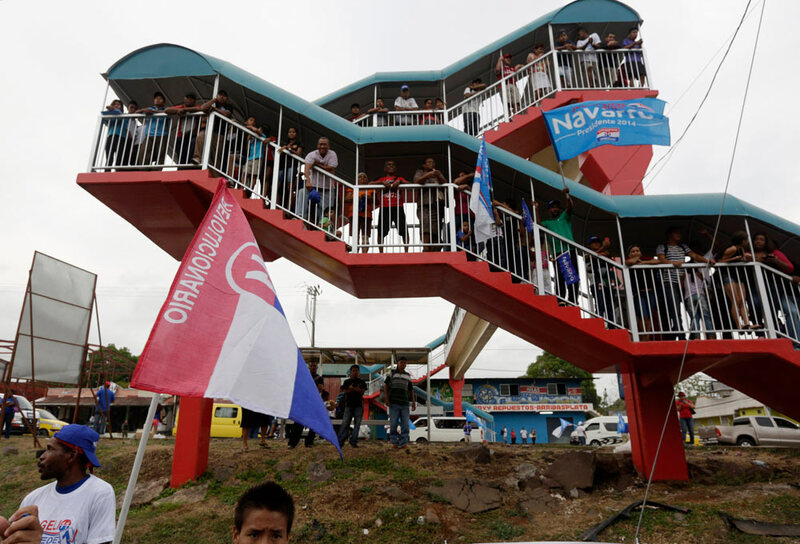 Supporters on pedestrian bridge wait for Democratic Revolutionary Party presidential candidate Juan Carlos Navarro's campaign rally on outskirts of Panama City, April 22, 2014. 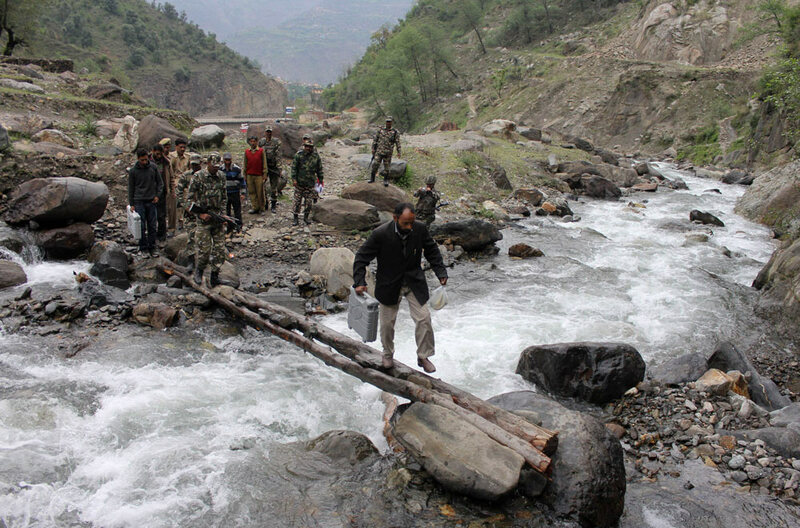 An India election offical carries an electronic voting machine to be used at a polling station across a makeshift bridge. 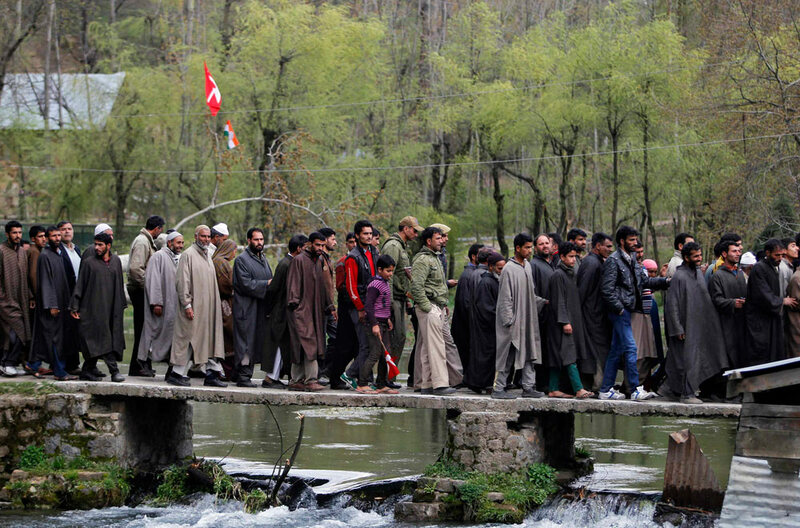 Supporters of Kashmir's ruling NC party cross a bridge after attending an election campaign by Kashmir's CM Abdullah. 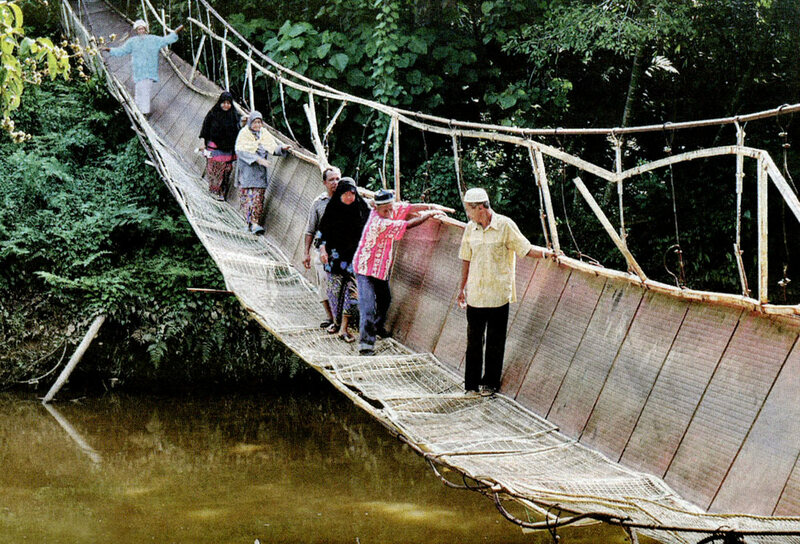 Villagers in Kampung Pamah Aur, Kuala Lipis, Malaysia, put their lives on the line when they crossed this dangerously broken bridge. 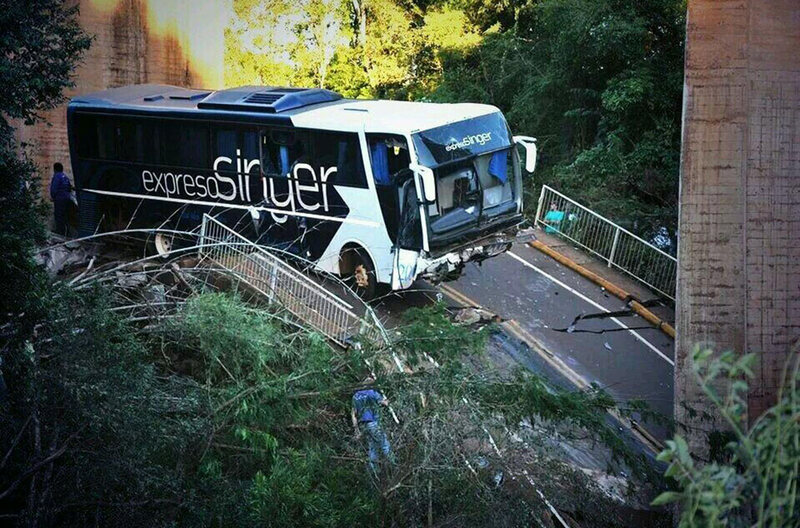 Men working on April 14, 2014 next to a bus which plunged when a bridge gave way in the Argentine northeastern province of Misiones. 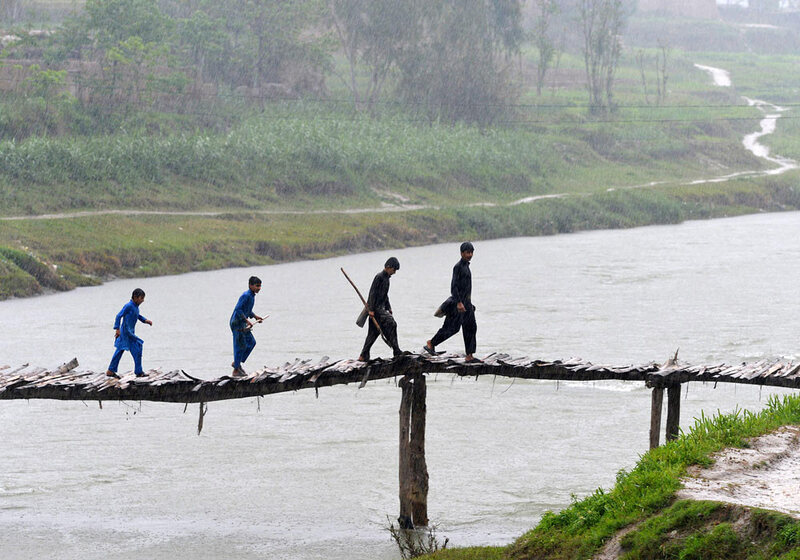 Afghan refugee boys cross a temporary wooden bridge at Jalala refugee camp in Mardan on April 2, 2014. 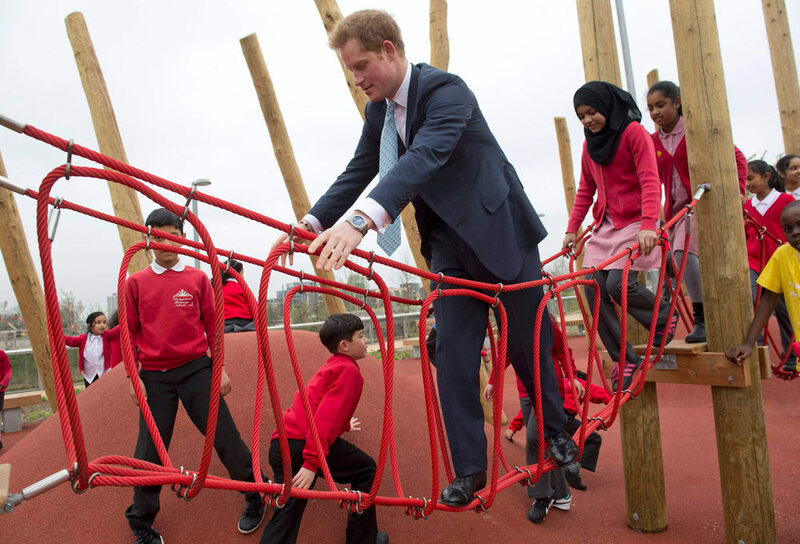 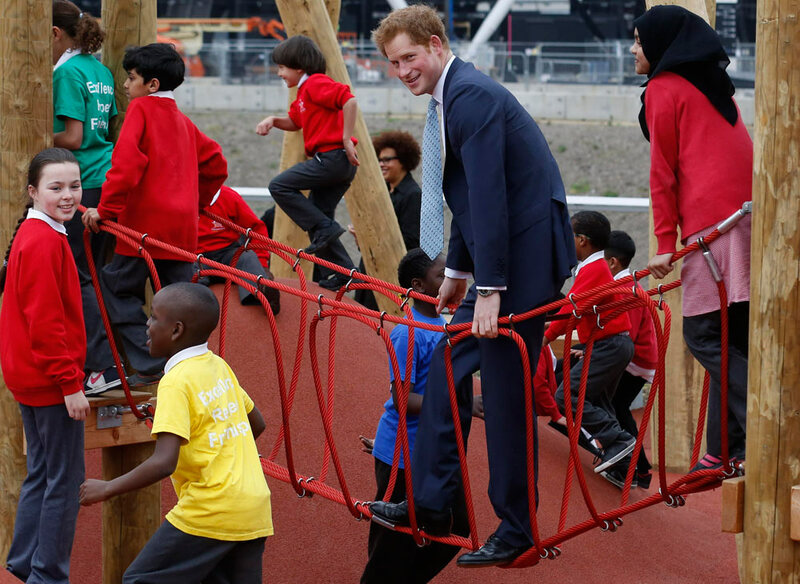 Britain's Prince Harry walks across a rope bridge as he plays with children during a tour of the Queen Elizabeth Olympic Park in east London, April 4, 2014. 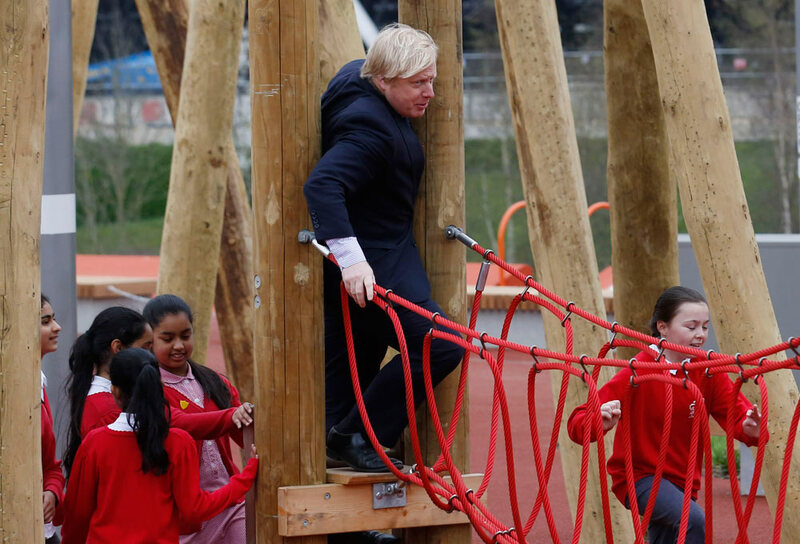 Mayor of London Boris Johnson jumps off a children's play rope bridge when he and Prince Harry (not pictured) viewed the Queen Elizabeth Olympic Park at Stratford. 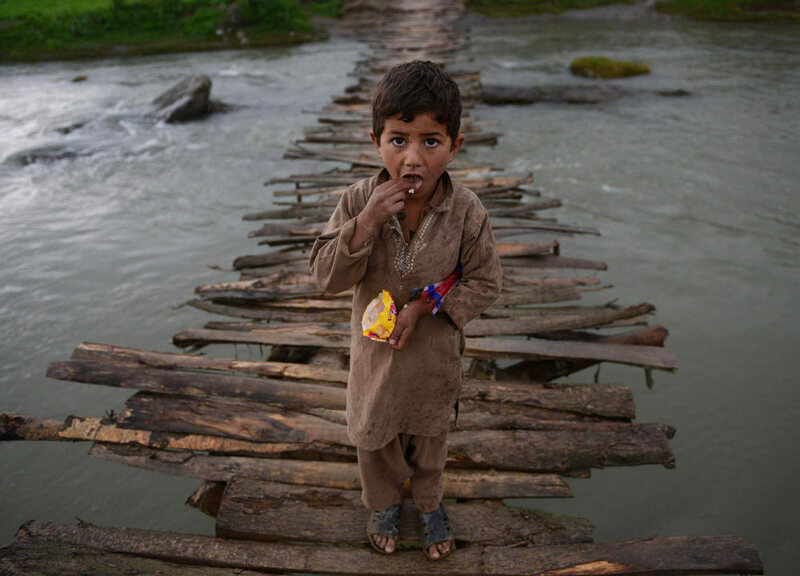 An Afghan refugee boy crosses a temporary wooden bridge at Jalala refugee camp. 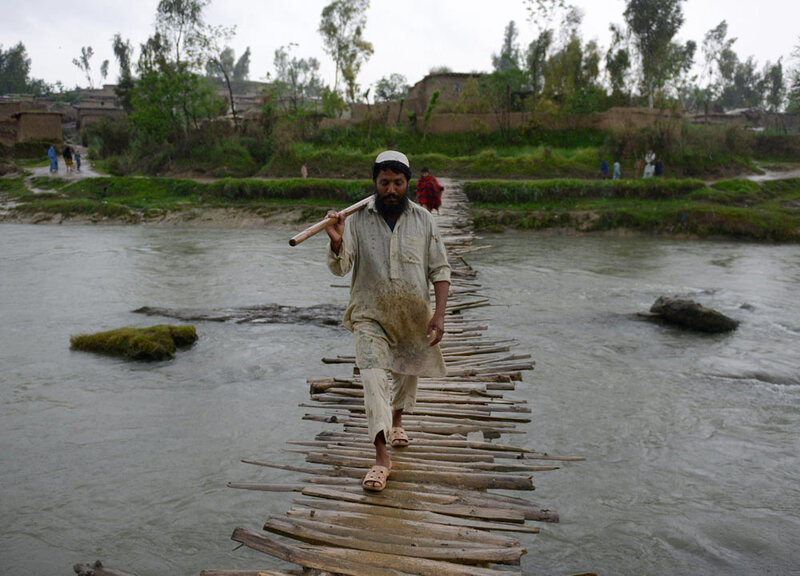 Afghan refugee labourer crosses a temporary wooden bridge at Jalala refugee camp on April 2, 2014. 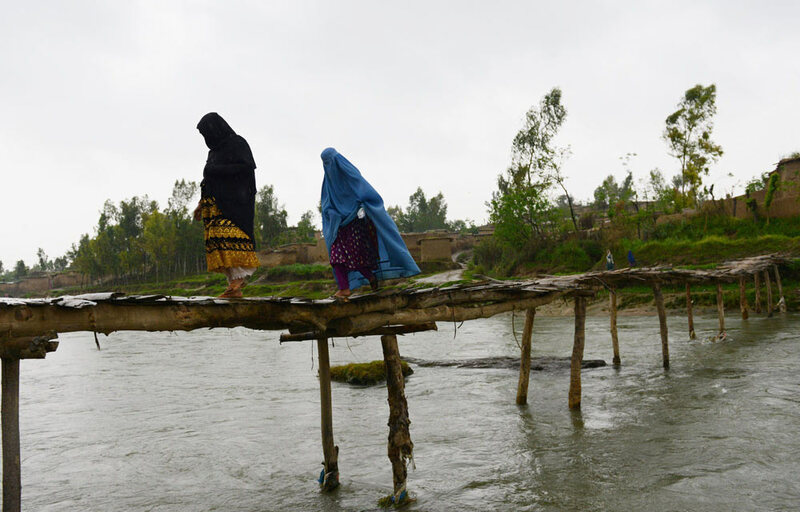 Afghan refugee women cross a temporary wooden bridge at a refugee camp in Mardan on April 2, 2014. 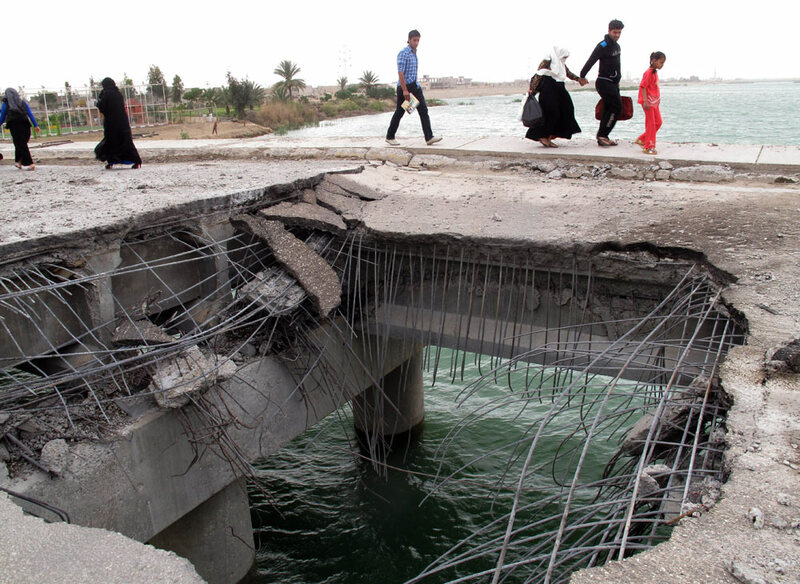 Iraqis walk past a gaping hole following a suicide bombing along the center of the al-Hoz Bridge on March 30, 2014. 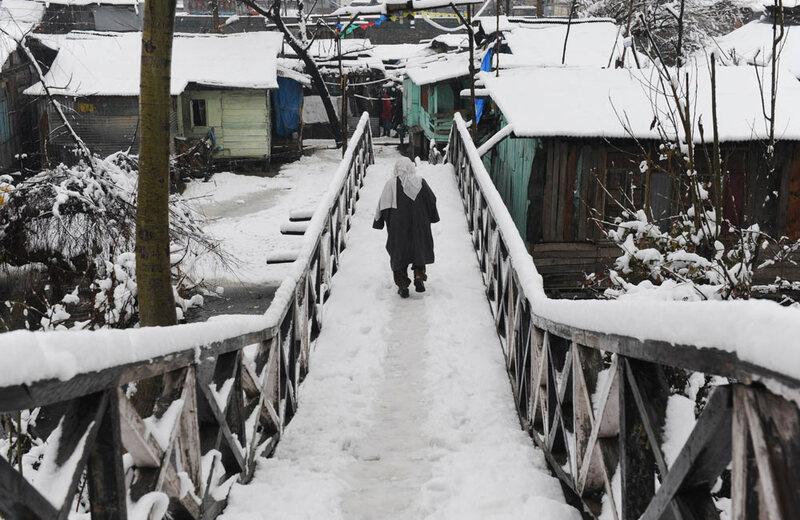 A Kashmiri resident crosses a foot bridge following heavy snowfall in Srinagar on March 11, 2014. 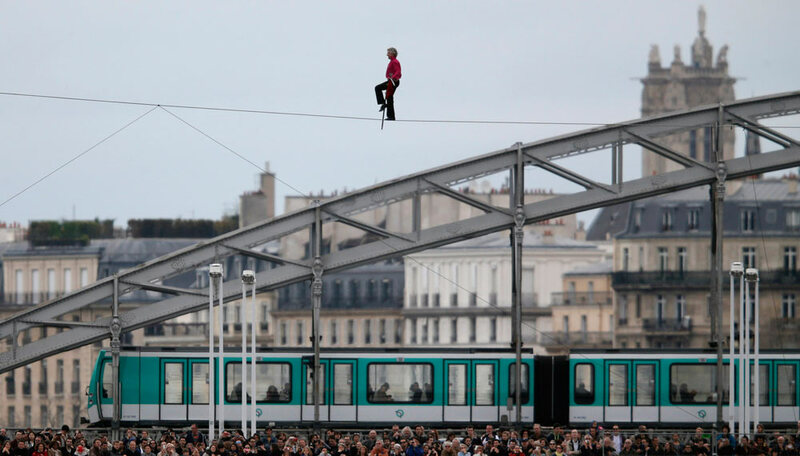 French acrobat Denis Josselin balances on a tightrope as he crosses the Seine river in front of the Austerlitz bridge in Paris, April 6, 2014. 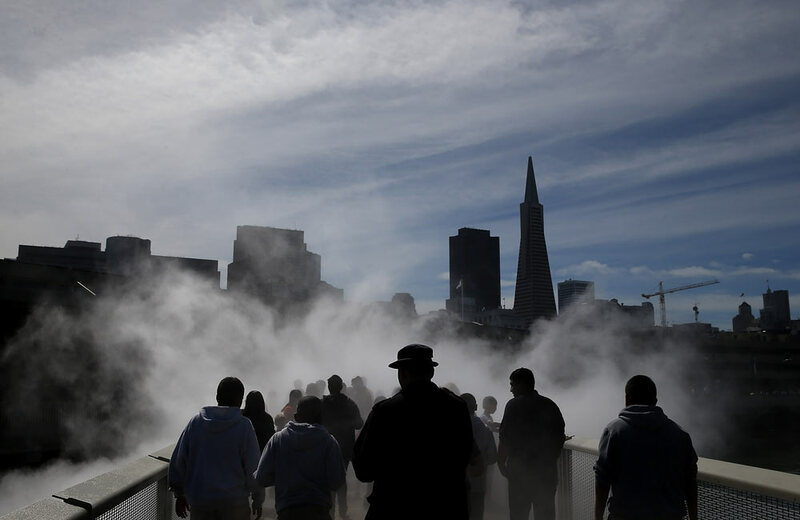 The "Fog Bridge" at the Exploratorium in San Francisco. 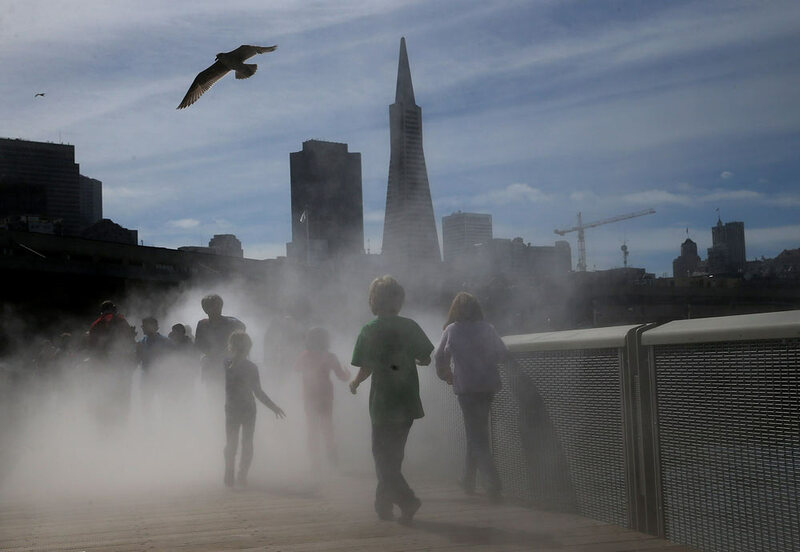 The bridge uses water pumped at high pressure to create a misty fog-like environment. 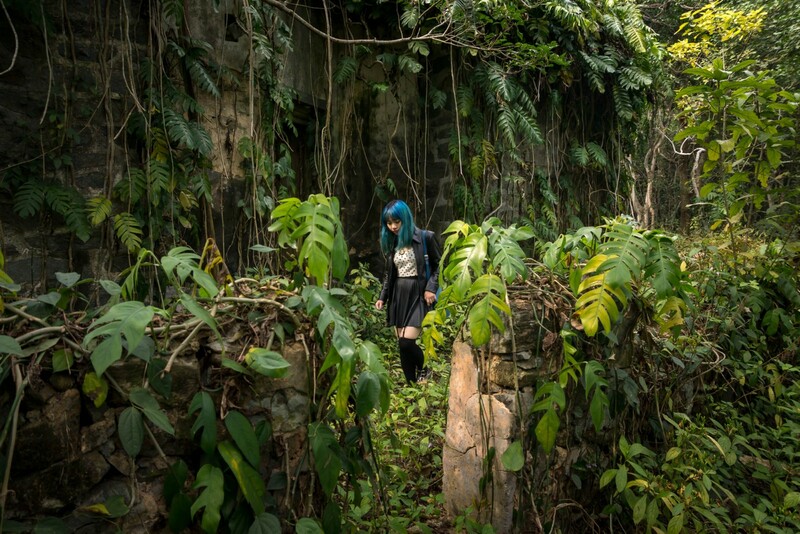 Vietnamese model Jessica Minh Anh transformed the Gardens by the Bay skyway into a fashion runway. 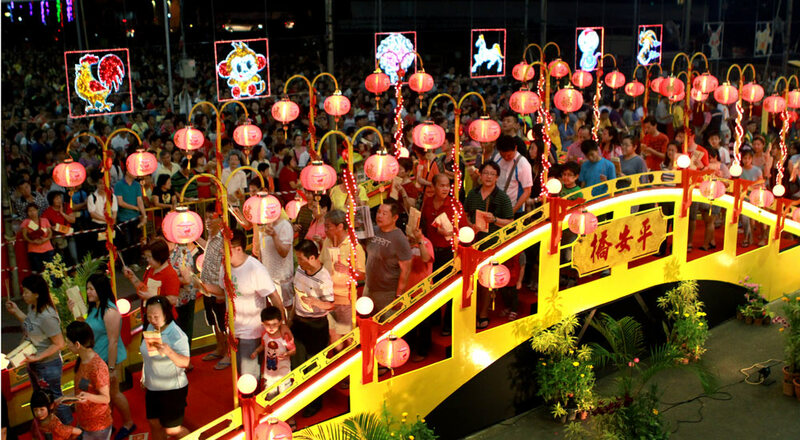 Devotees crossing a wooden bridge at Loyang Tua Pek Kong temple on March 2, 2014 as part of a good-luck ritual. 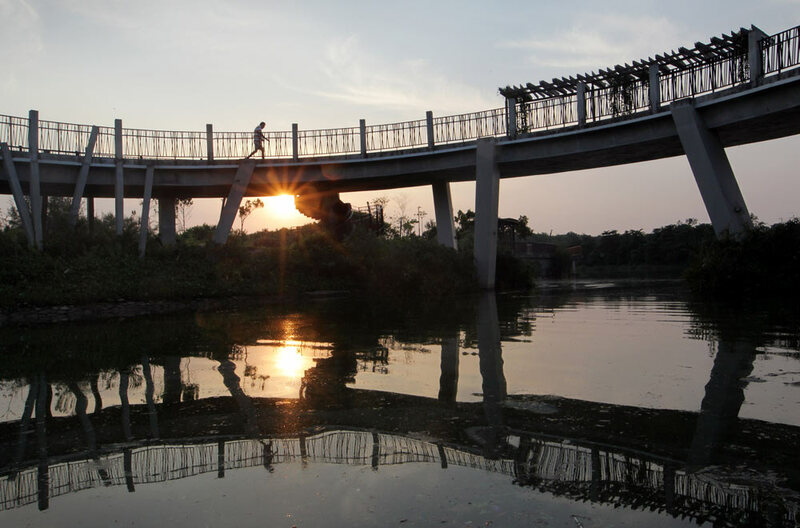 Morning joggers during sunrise at the Punggol Promenade Riverside Walk's Sunrise Bridge. 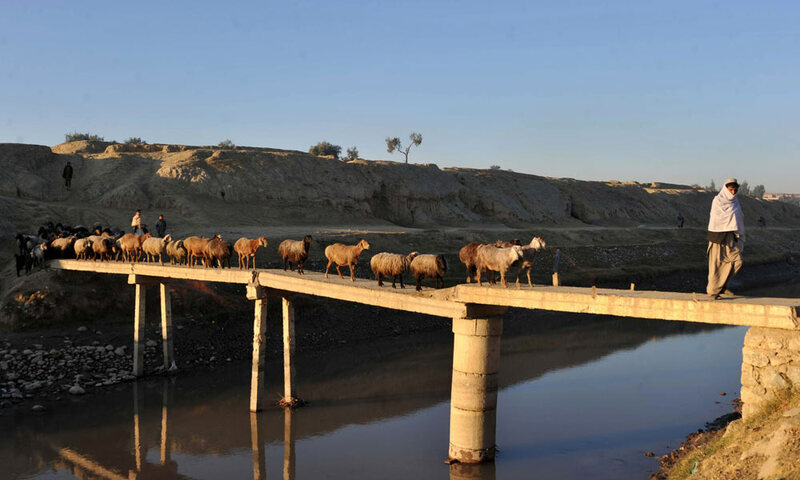 An Afghan shepherd leads his flock of sheep across a bridge on the outskirts of Jalalabad on February 8, 2014. 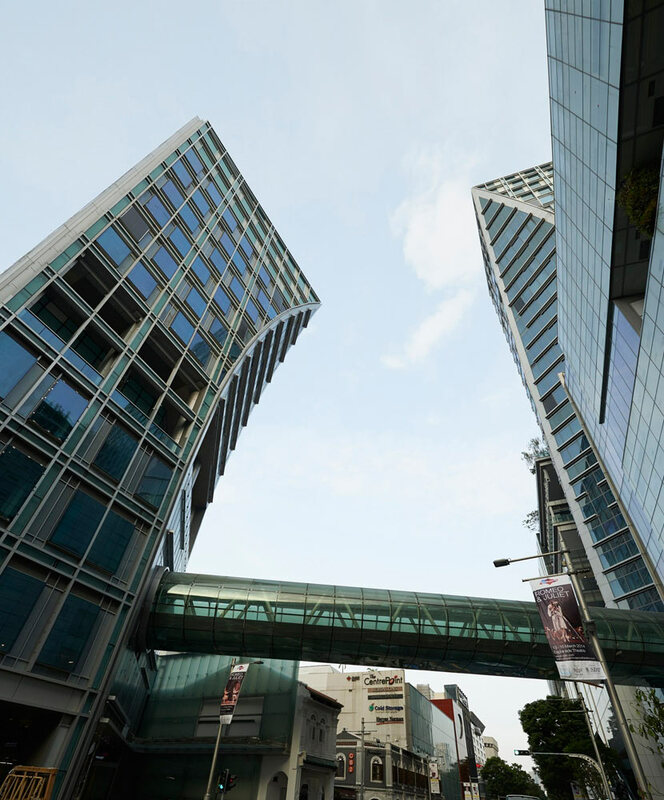 Orchard Gateway: the glass link bridge connects two buildings that are diagonally opposite each other. 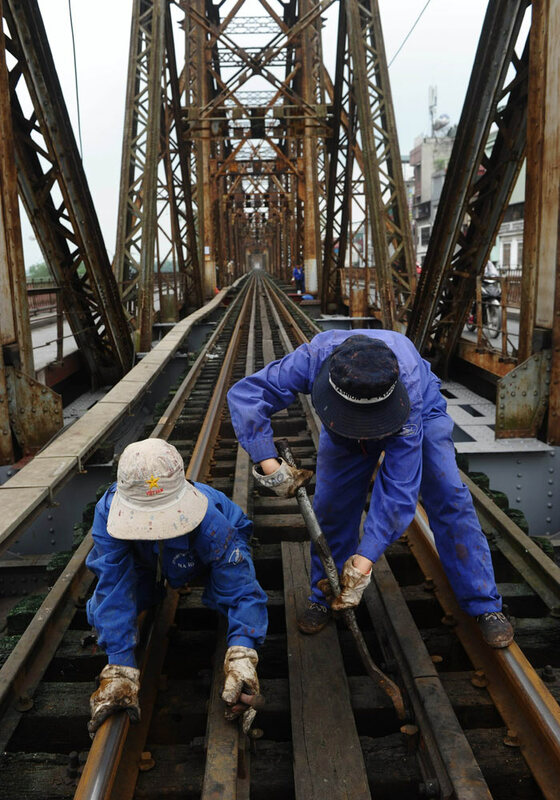 Urgent maintenance work on rail tracks on the hundred-year old Long Bien (former Paul Doumer) bridge in Hanoi on April 24, 2014. 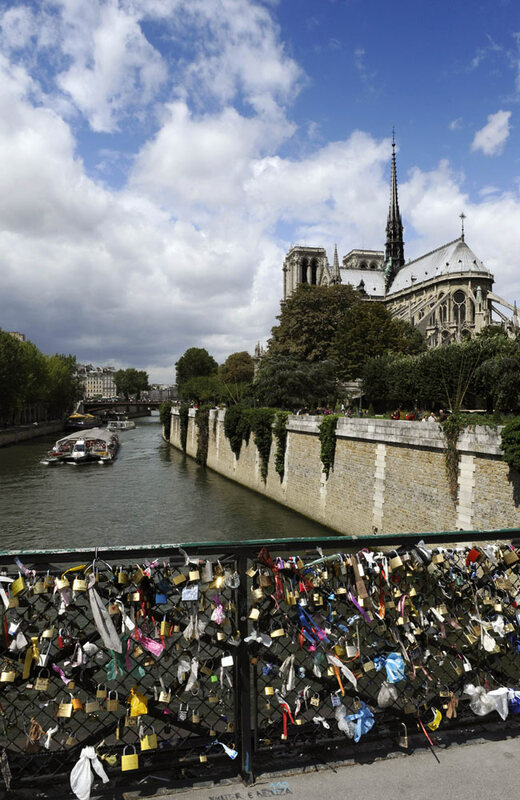 Padlocks hitched by lovers on the Pont Saint Louis bridge in Paris on October 4, 2010. 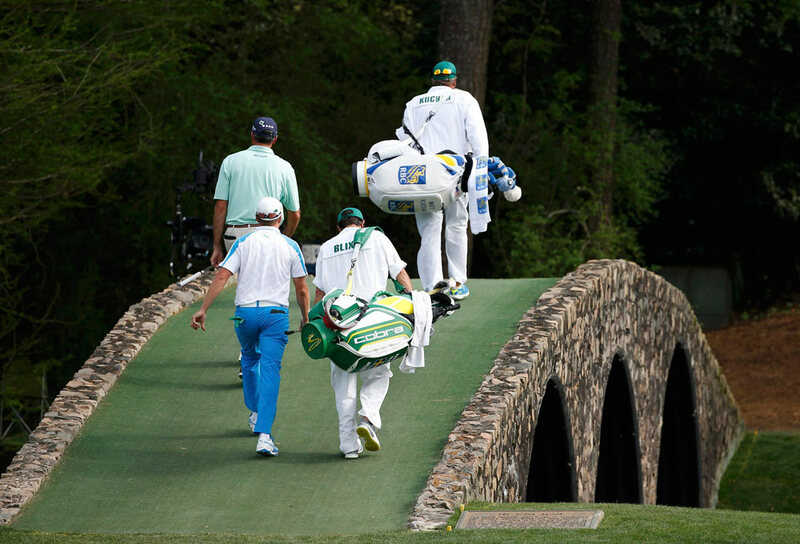 Sweden's Blixt and Kuchar of the U.S. cross the Hogan Bridge in the Masters golf tournament at the Augusta National Golf Club. 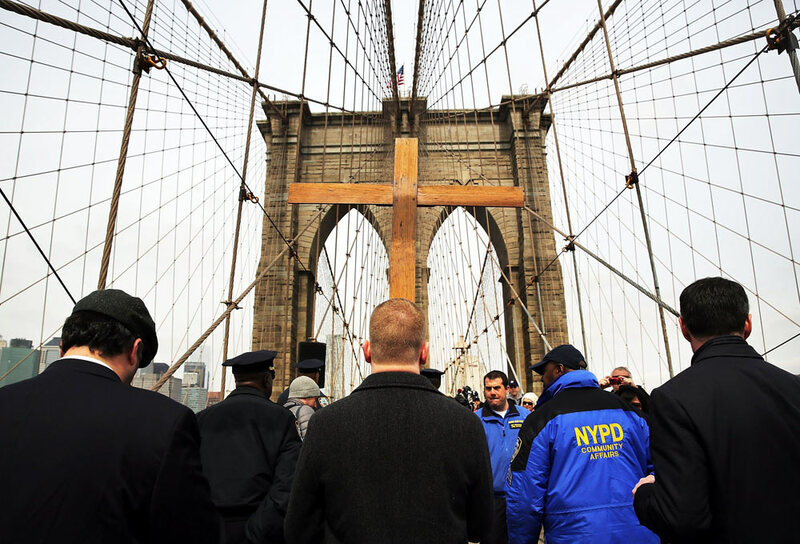 Members of the Archdiocese of New York and the Diocese of Brooklyn lead the Way of the Cross procession over the Brooklyn Bridge on April 18, 2014 in New York City. 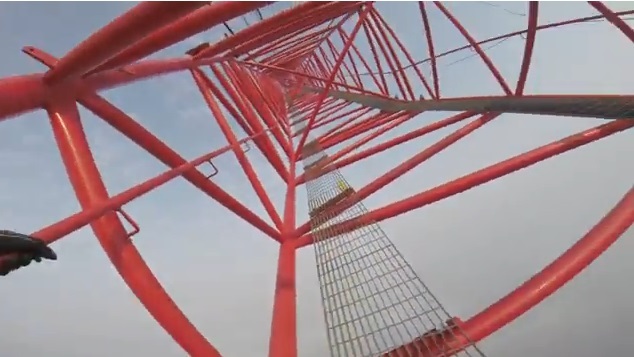 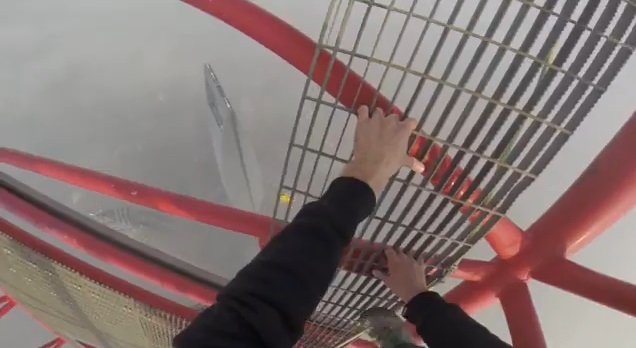 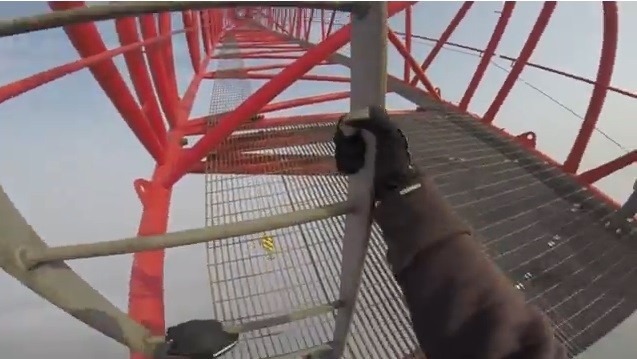 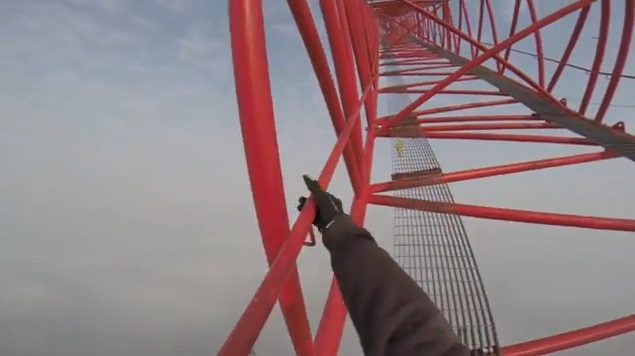 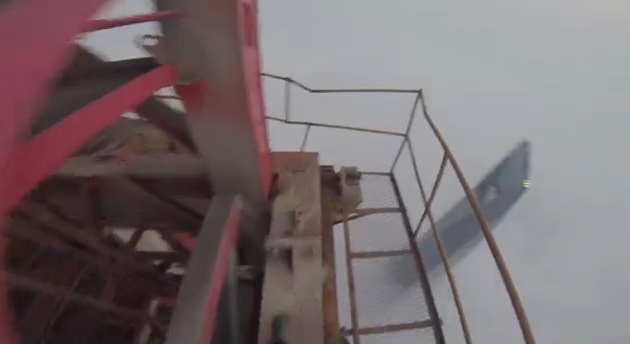 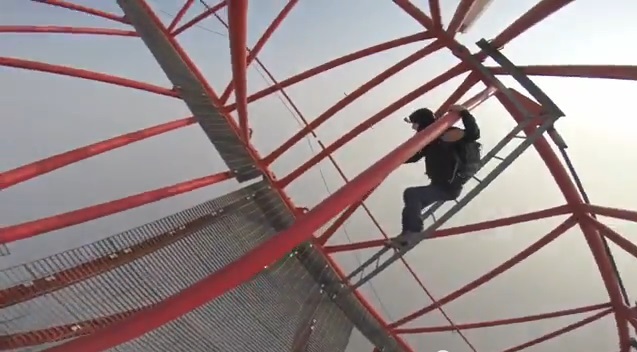 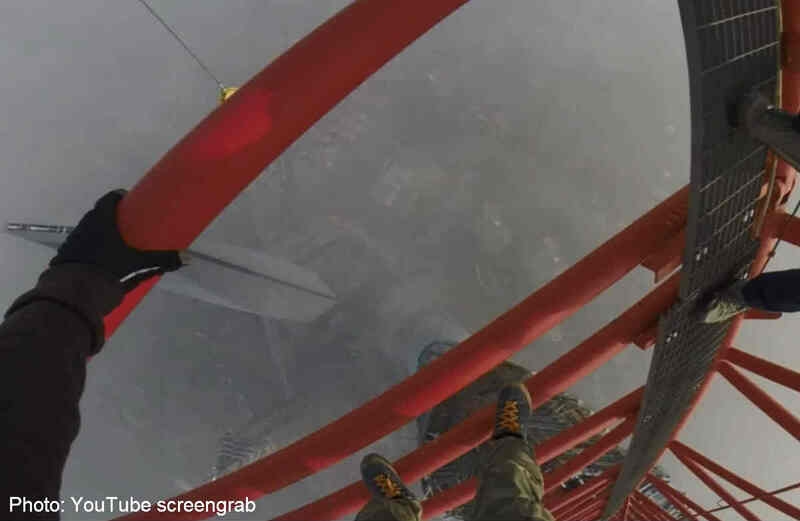 Two young Chinese men recently snuck into the Shanghai Tower construction site with the goal of climbing to the top. 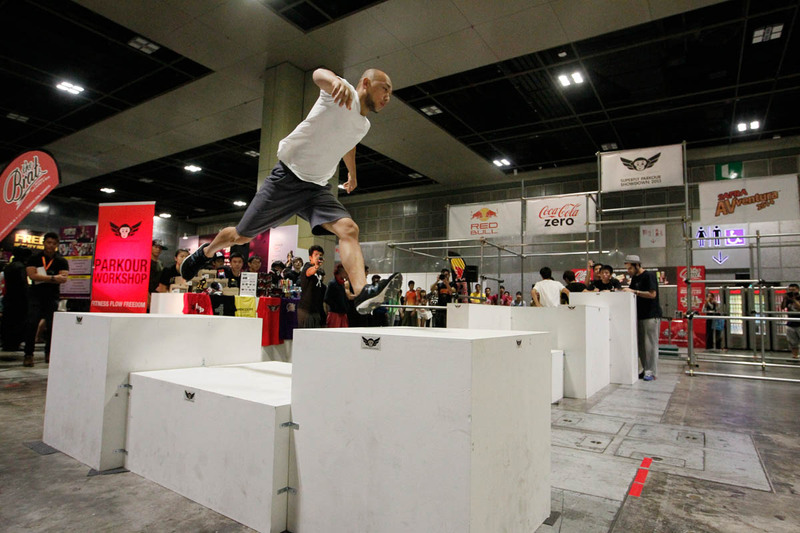 They were inspired by two European daredevils, who had achieved the feat, reports Kotaku. 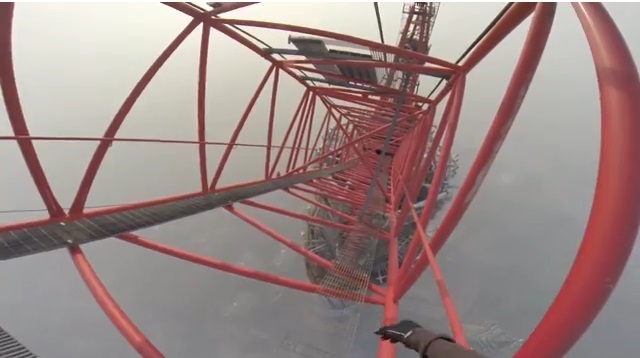 One of the Chinese climbers told DongFang Daily newspaper: "If foreigners can climb to the top, then we can, too." 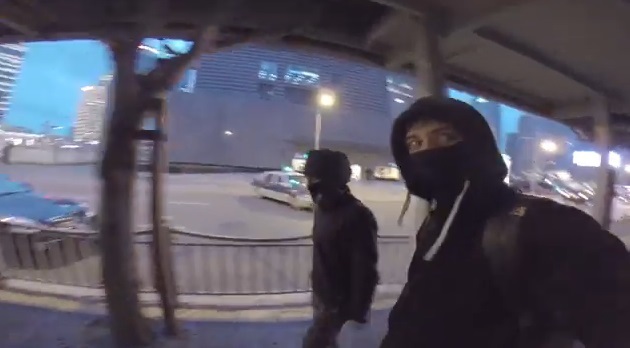 Unless this is an elaborate hoax, the two appear to have accomplished their goal. 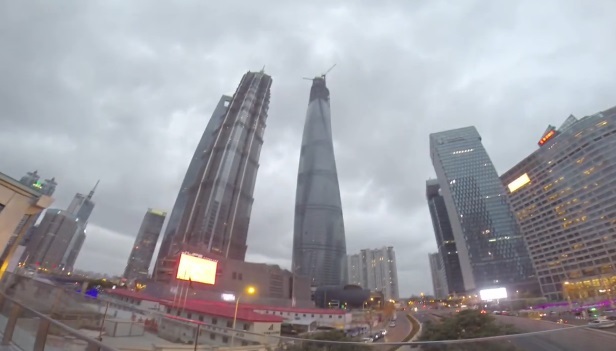 The Shanghai Tower is still under construction and is slated to open in 2015. 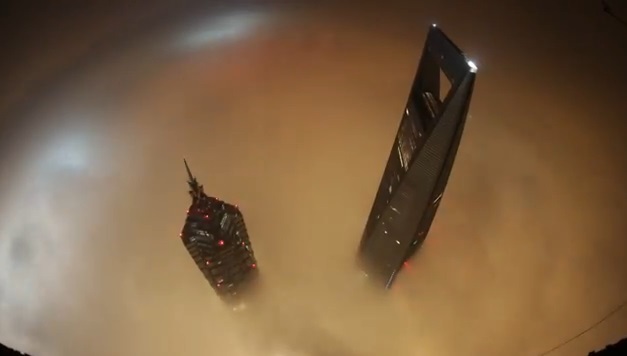 But at 650 meters (2,132 feet), it's the tallest structure in China and the second tallest building in the world. 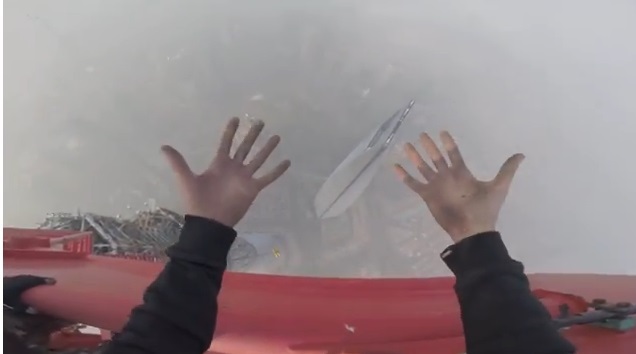 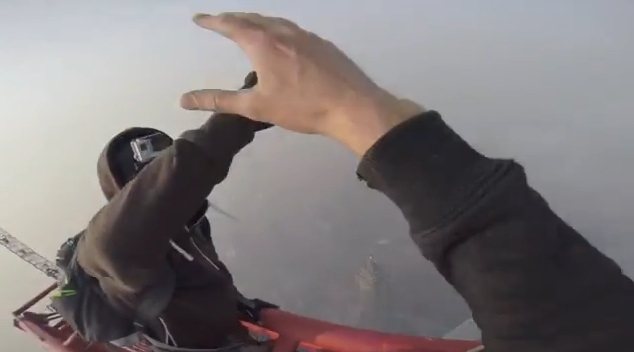 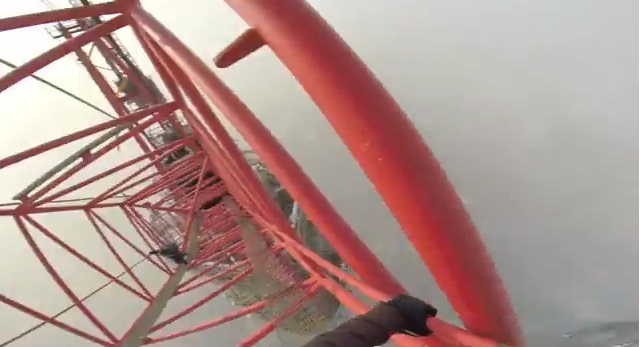 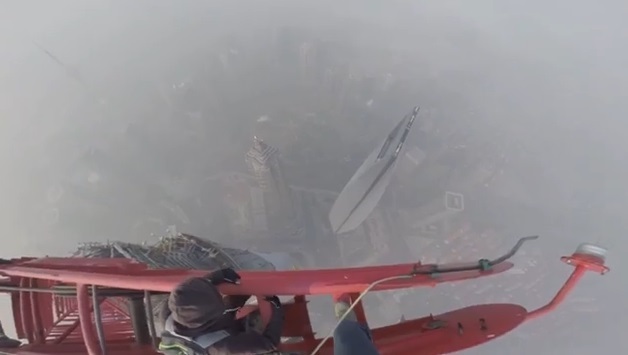 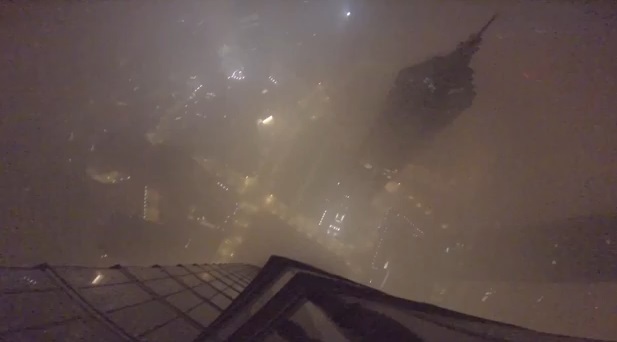 A pair of daredevil climbers ascended to the top of the world's second tallest building in China's commercial hub Shanghai, posting a stomach-turning video which has received more than 1.5 million views. 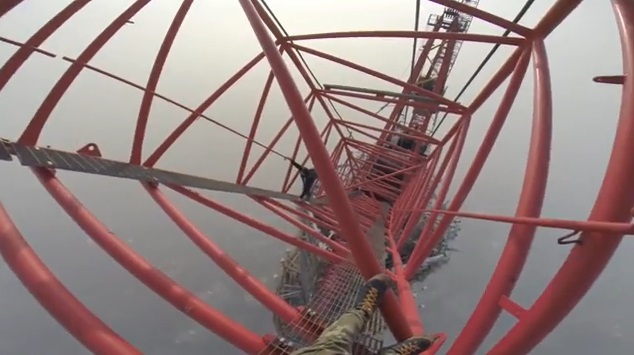 The duo, who identified themselves as Vadim Makhorov and Vitaliy Raskalov, said they scaled the Shanghai Tower, which will reach over 630 metres when it is finished this year if construction goes according to schedule. 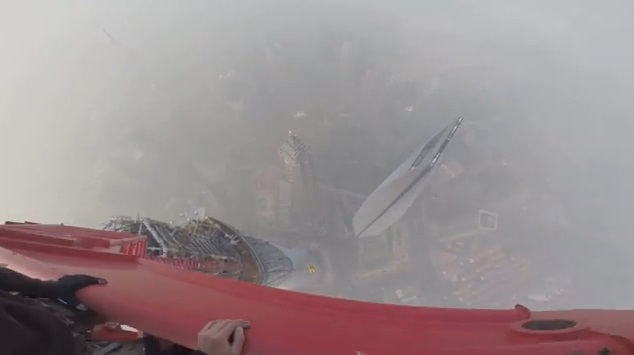 Globally it will be second only to the Burj Khalifa in Dubai, which stands at 828 metres. 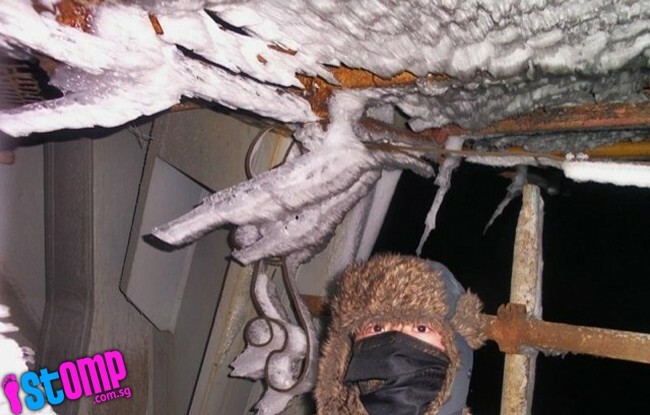 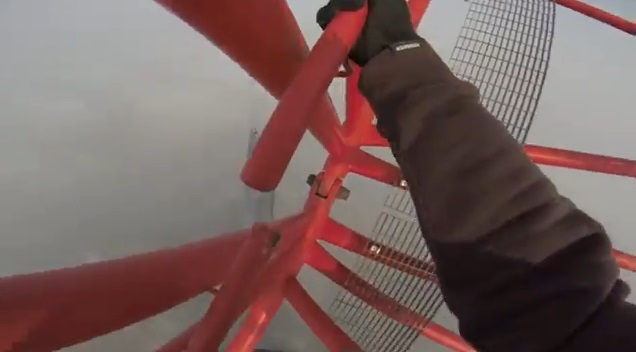 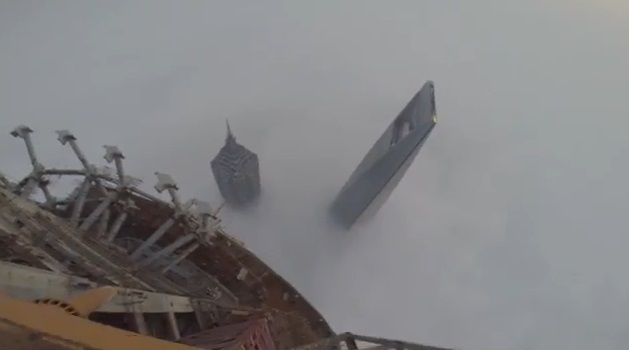 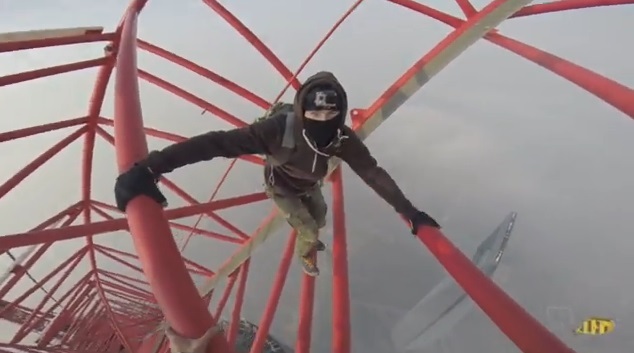 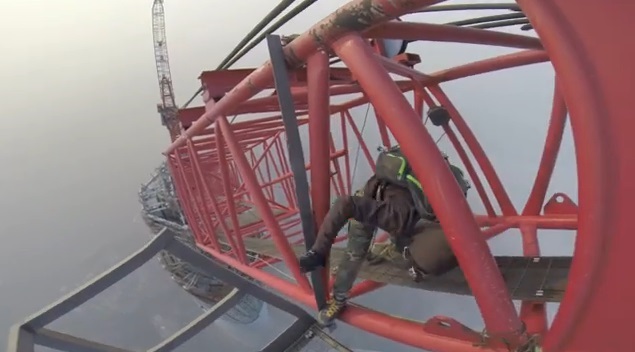 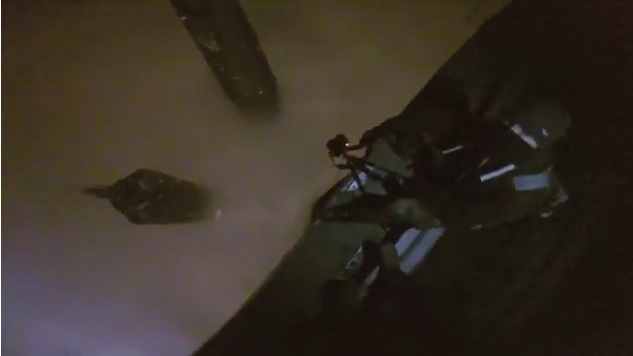 The video showed the two men, wearing black hoodies, walking up stairs, climbing ladders and finally scaling a crane at the top of the Shanghai Tower as they peered at buildings shrouded in clouds below. 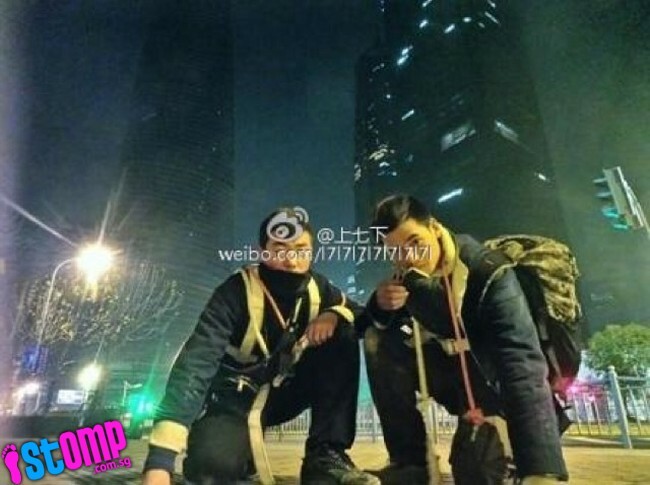 A video of their feat, posted on YouTube on Wednesday, had received more than 1.5 million views and more than 9,500 comments by Thursday night. 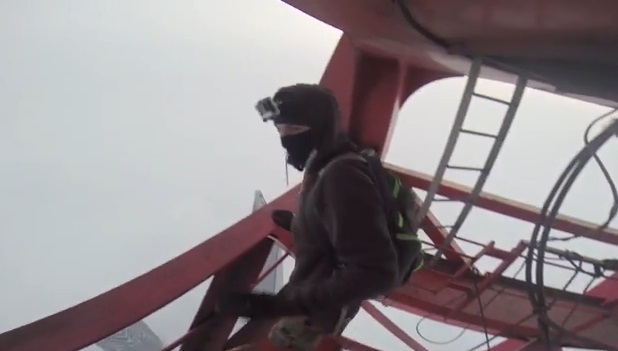 "At that time the security was less watchful, workers were on vacation," he said. 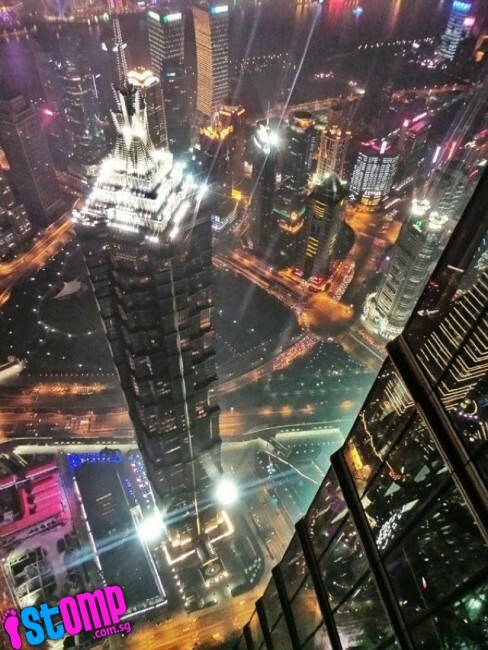 Mr Raskalov said on his blog that they started the ascent on Jan 31, the first day of Chinese New Year. 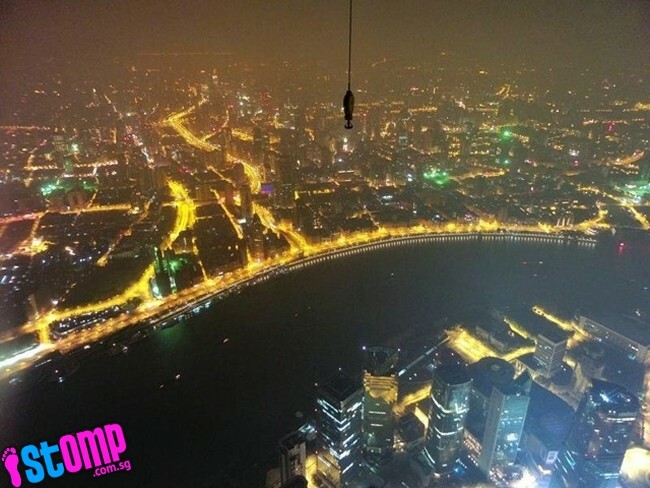 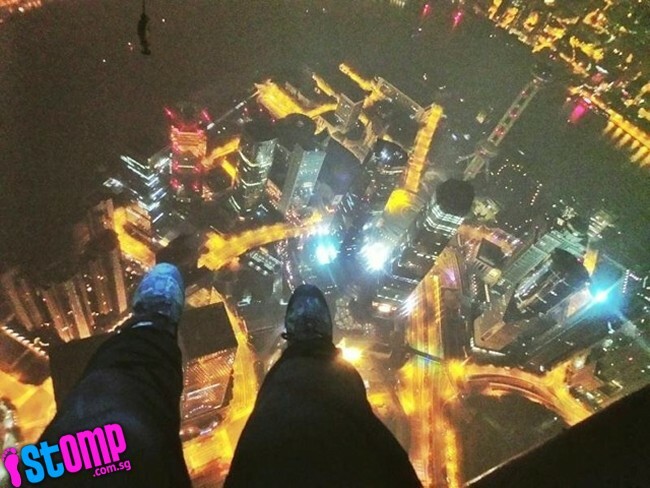 "It took us almost two hours to get on the 120th floor by foot. 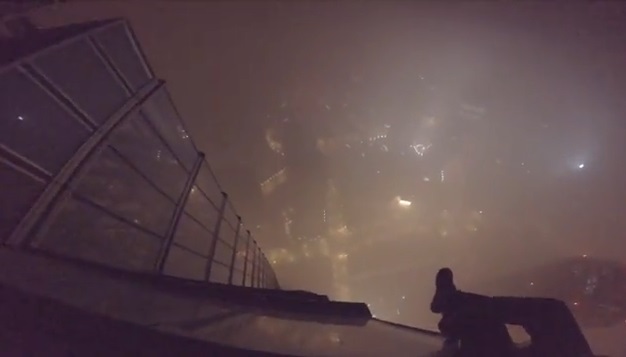 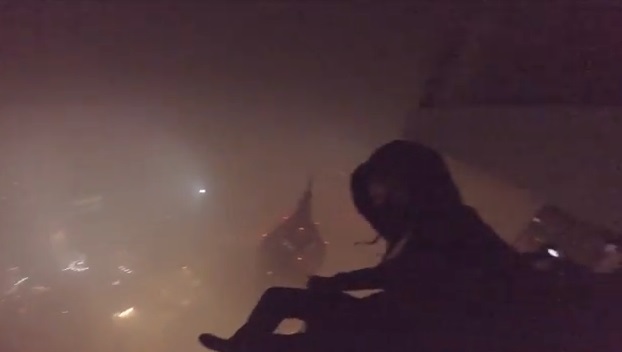 And also, we (spent) almost 18 hours on top of the building, sleeping and waiting for better weather." 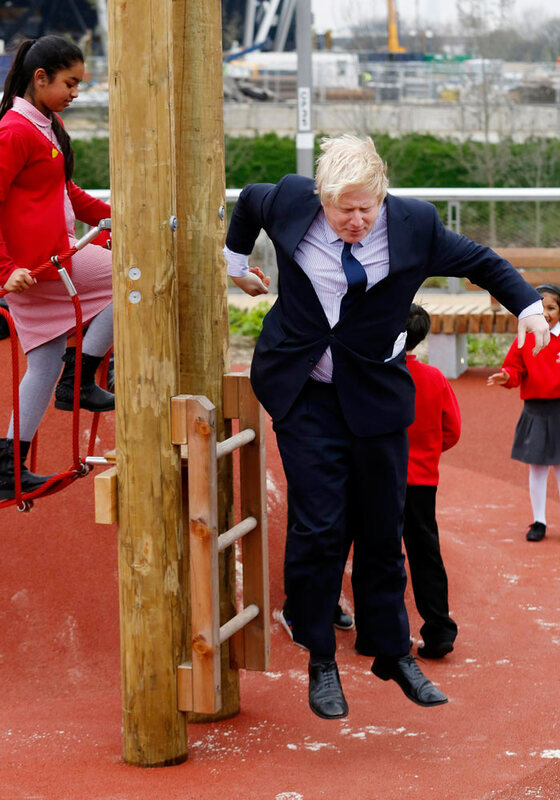 The duo, who use the name "OnTheRoofs", could not be reached for comment. 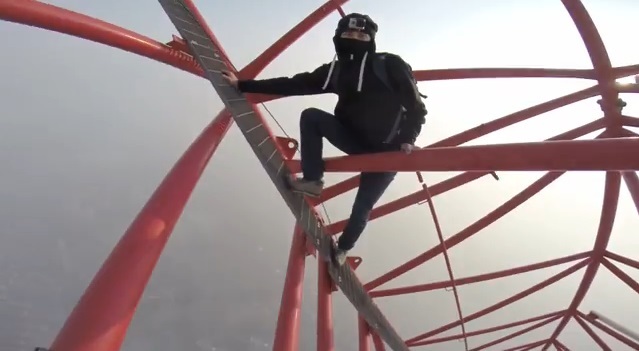 Media reports say they previously climbed the Great Pyramid of Giza. 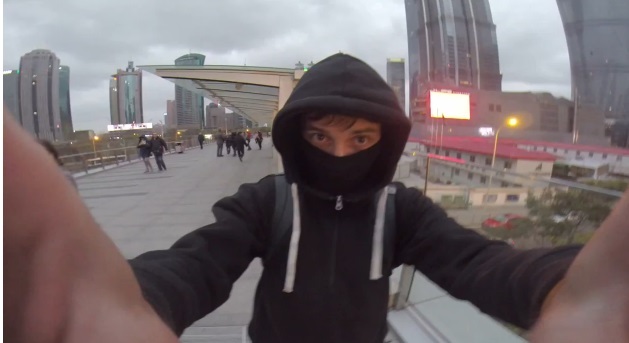 In China, where YouTube is blocked by authorities, the video was re-posted on several video websites. 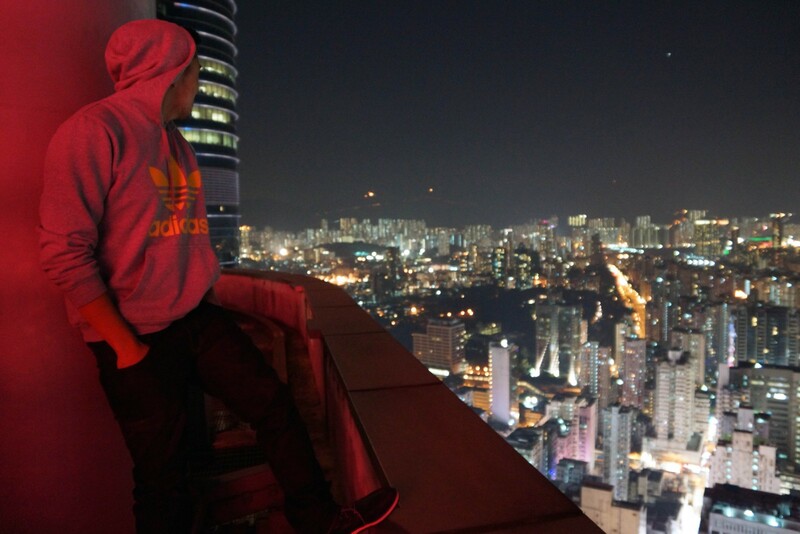 "My knees are getting weak just by watching. 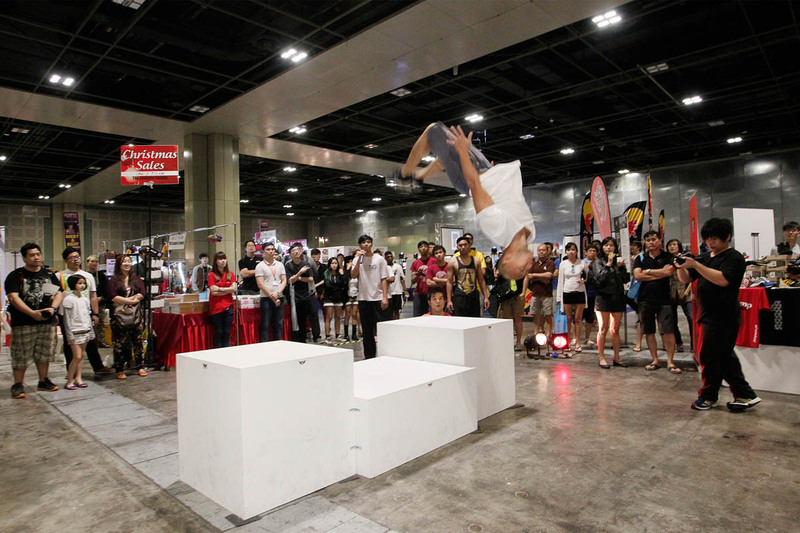 Hollywood blockbusters are nothing compared to this," said one netizen. 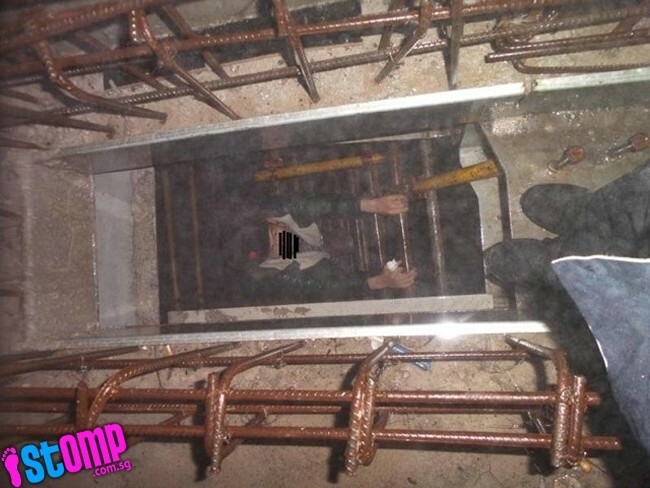 The building's management said steps would be taken to bar any repeat performances, according to a statement carried by state media. 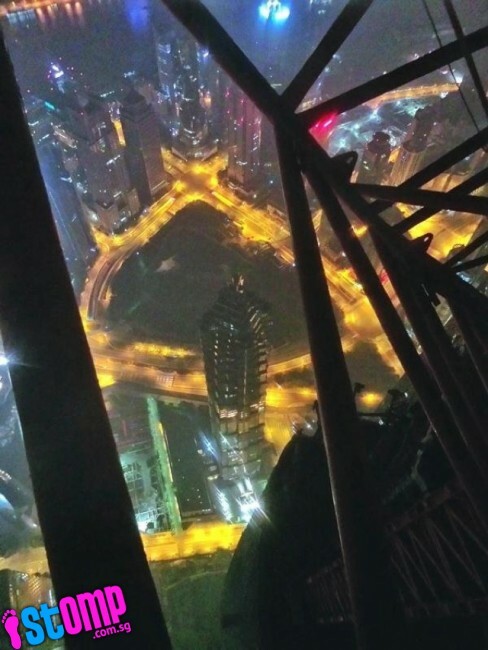 "Shanghai Tower will implement measures such as putting up wire fencing around the walls and installing safety doors on exits to avoid similar incidents from happening again," said the statement. 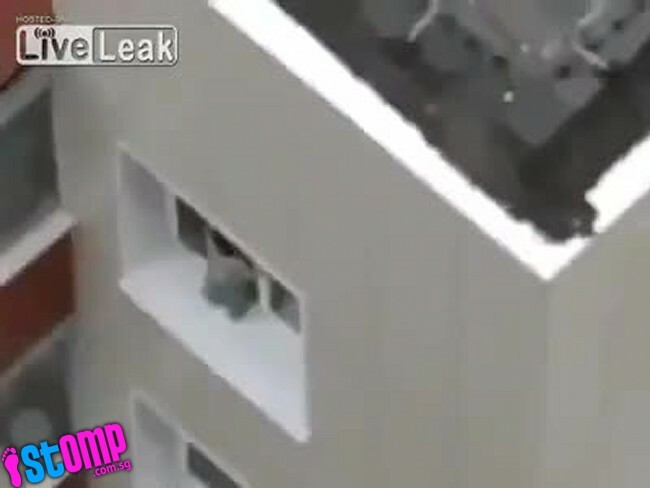 Viewers have stated how this is not the first clip they have seen of children ending up on window-ledges when left unattended. 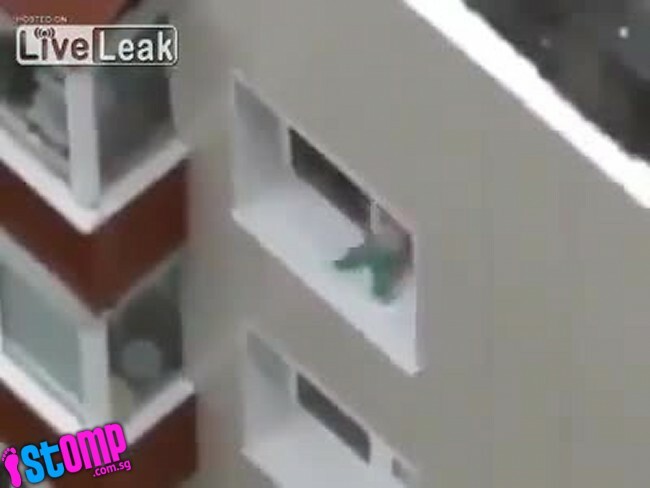 The video starts of with the camera zooming in to the child, who has managed to climb from the flat onto the ledge. 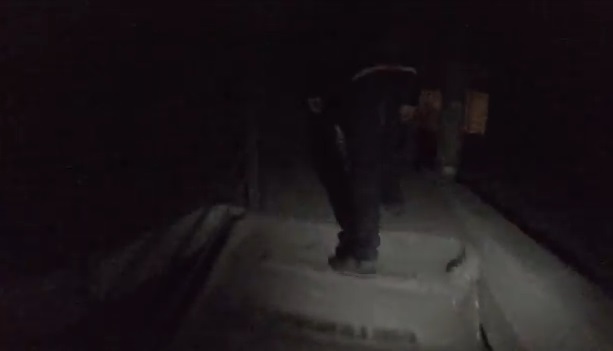 For the next few minutes, he walks around on the ledge, and peeks over the edge. 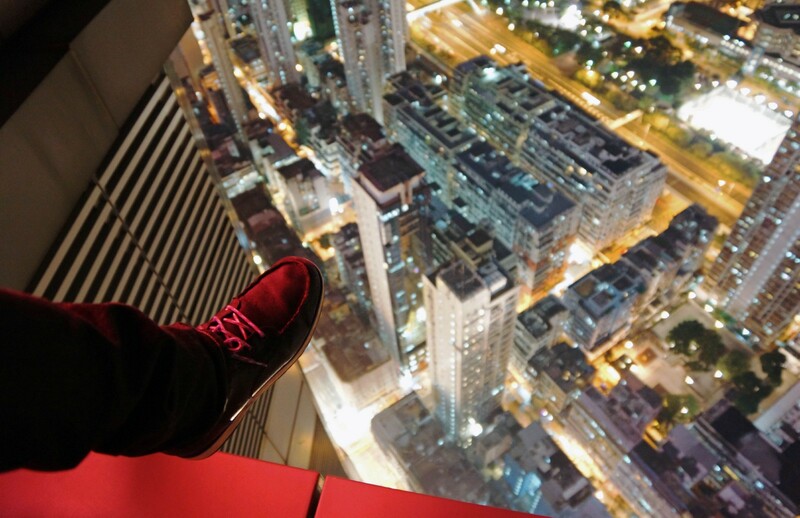 Towards the end of the clip, he even sits at the very edge of the ledge and dangles his legs. 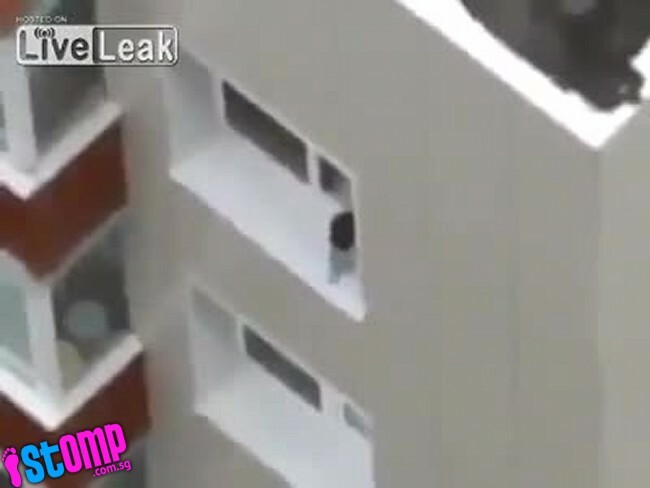 He then stands up to walk around the ledge, when someone from inside the flat grabs him and pulls him in. 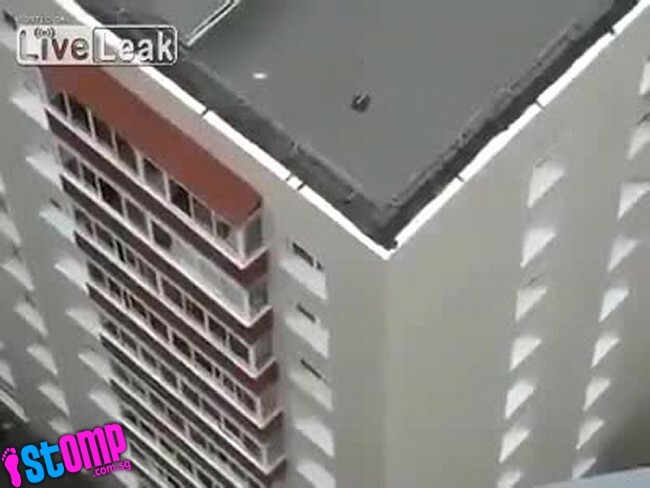 Stomp contributor Aimnfire said: "I saw this video on facebook. 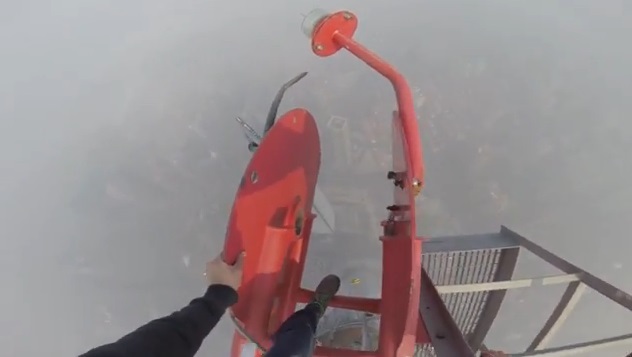 My heart can stop beating just by watching this." 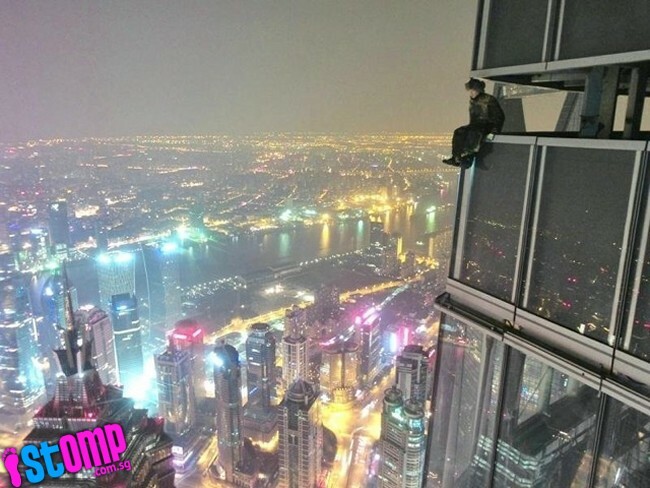 Dangling his feet off the edge of a skyscraper more than fifty storeys above the streets of Hong Kong, Jonathan Tsang looks as relaxed as if he was kicking back in his own living room. 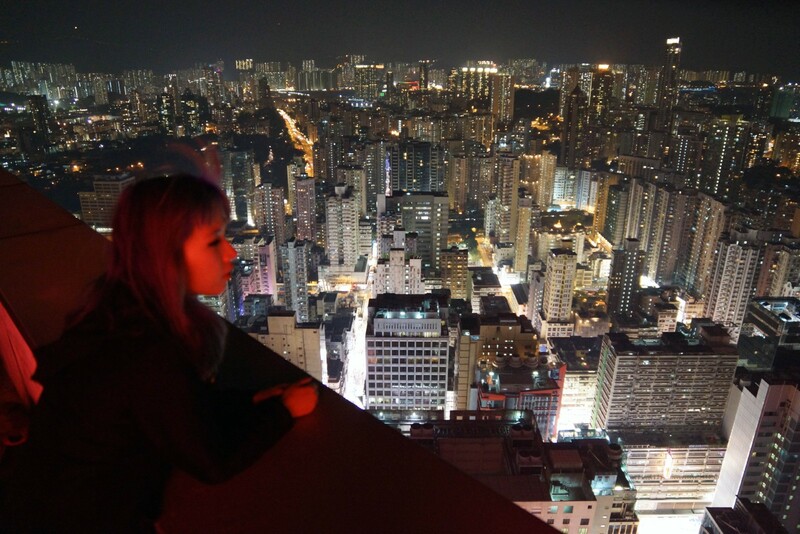 "The population is really dense and sometimes it's just kind of suffocating to the point where you need some time to yourself," said 25-year-old Tsang. 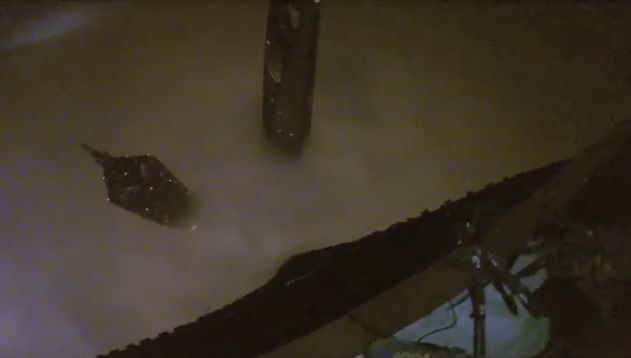 "That's mostly why I come up here." 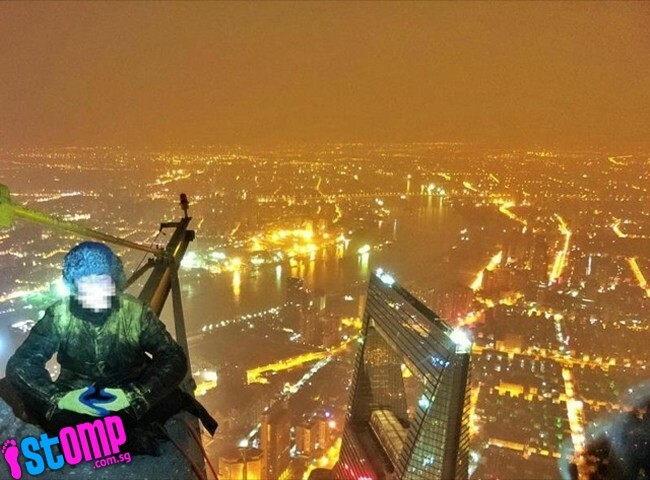 Airin, a 25-year-old office worker by day, is a keen rooftopper. 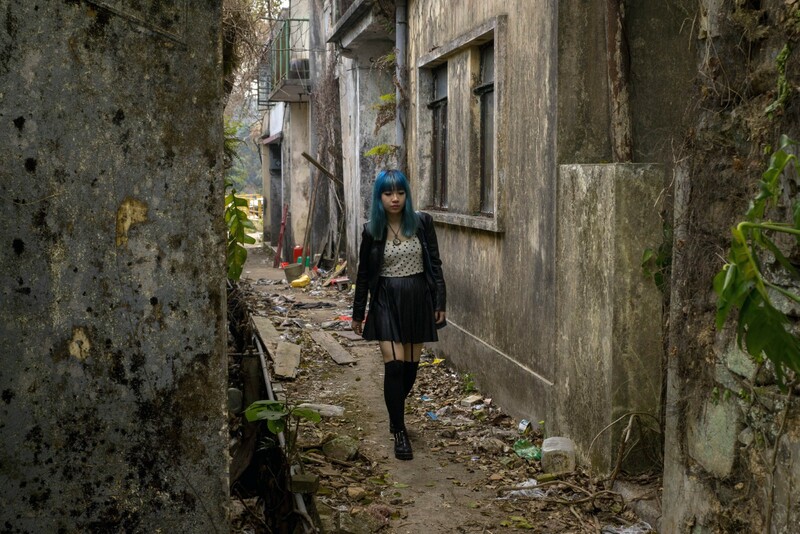 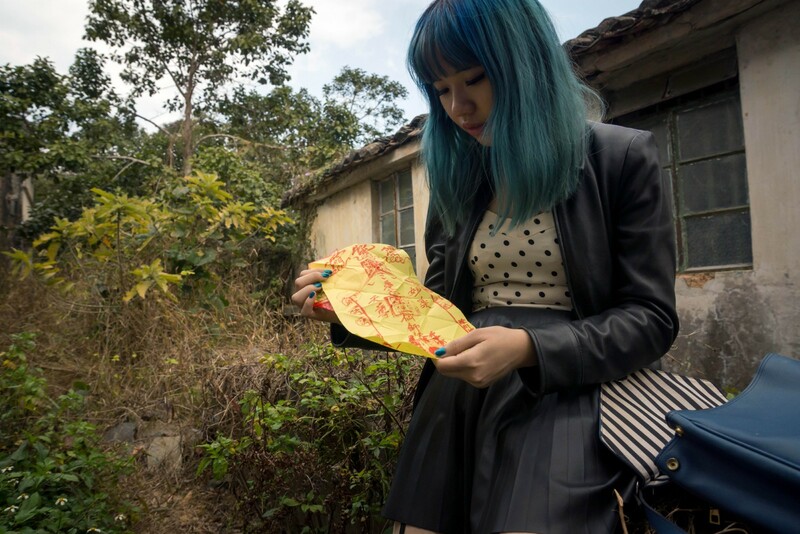 Airin also spends much of her time exploring Hong Kong's myriad of abandonments, from shuttered mental asylums to discarded factories and crumbling apartment blocks. 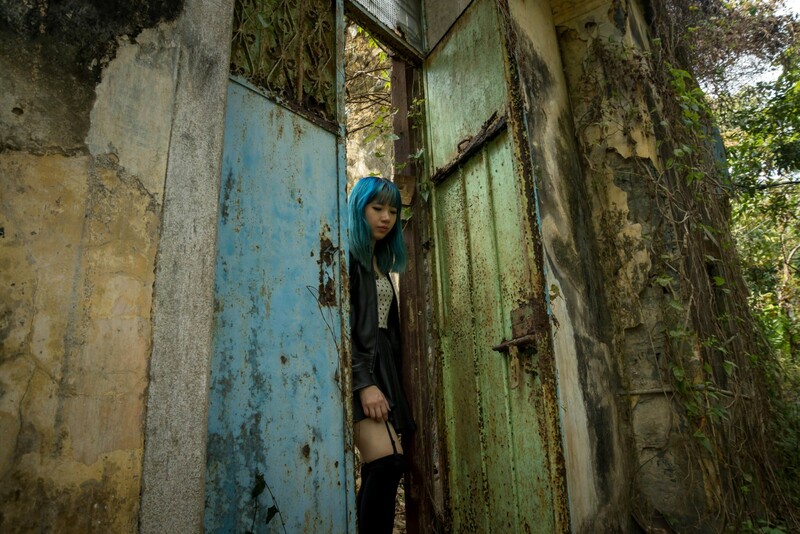 Sporting bright blue hair, suspenders and a leather skirt, Airin looks like a character from a Manga comic. 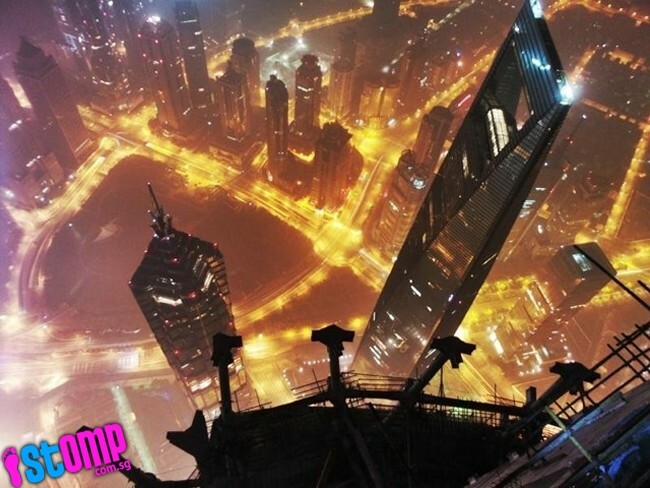 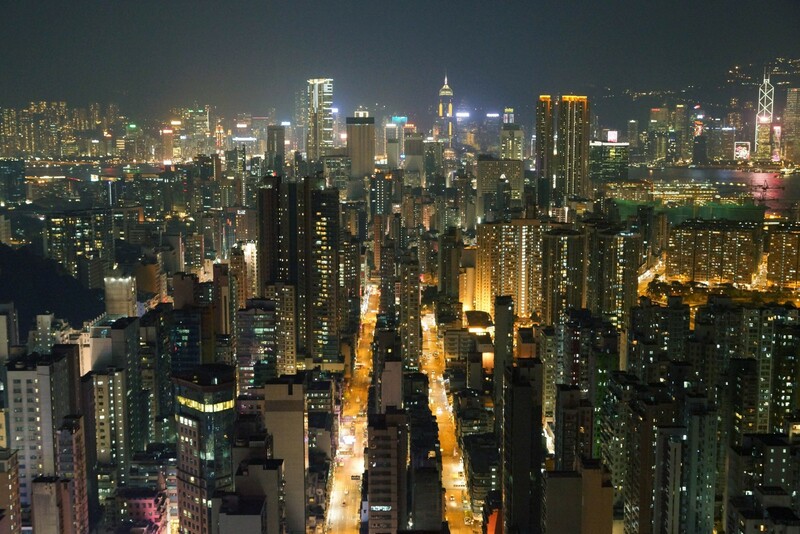 Hong Kong, a city with more skyscrapers than anywhere else in the world, is a particularly attractive destination for both local and international "rooftoppers". 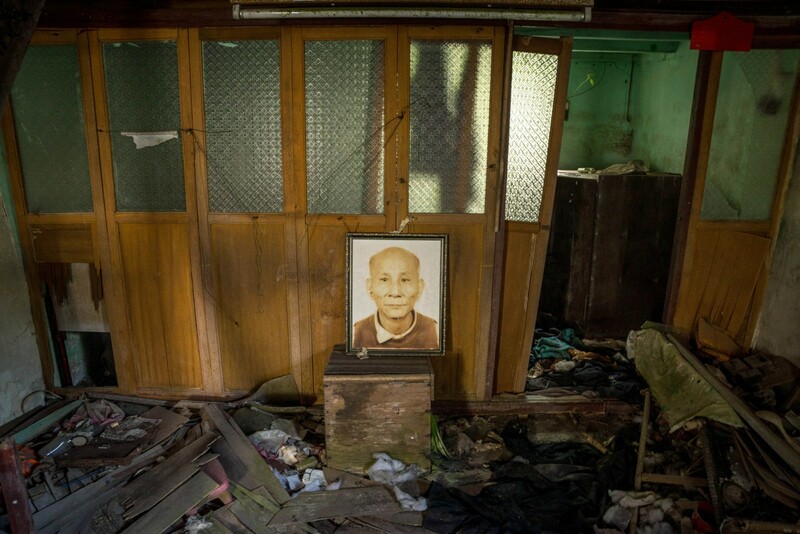 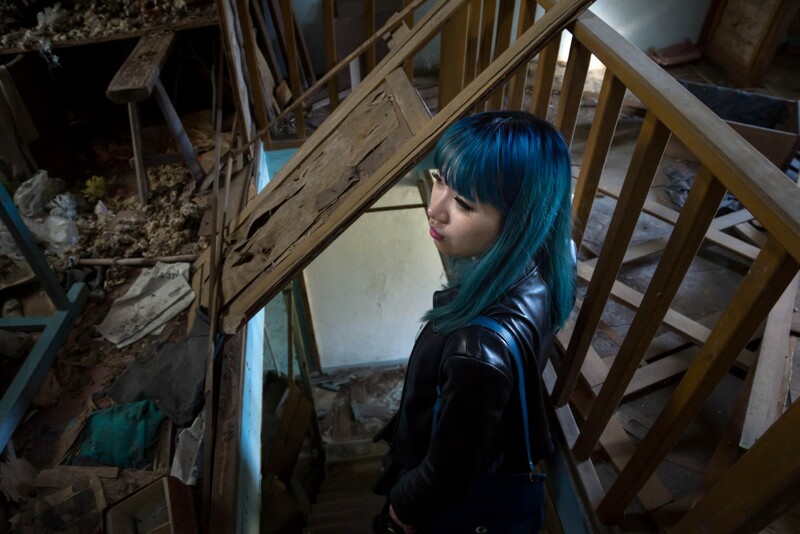 For Airin, who has gone urbexing as far afield as Russia, South Korea and Japan, abandonments offer a hidden window into the past. 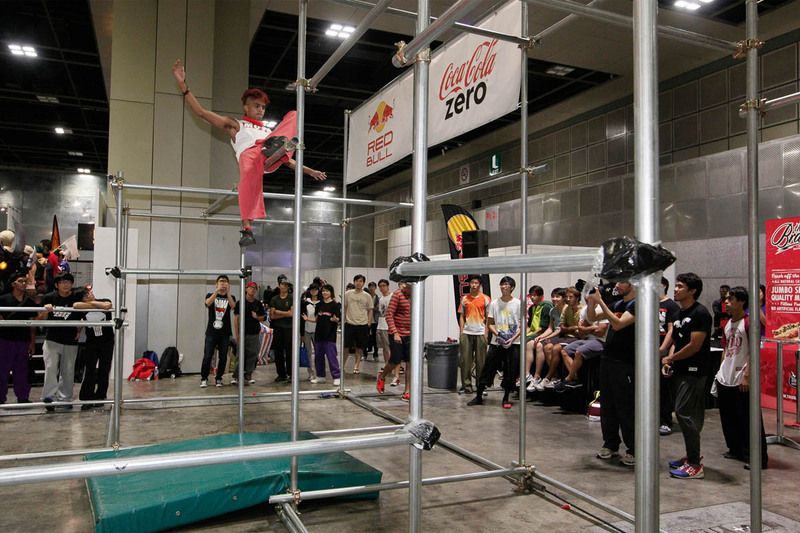 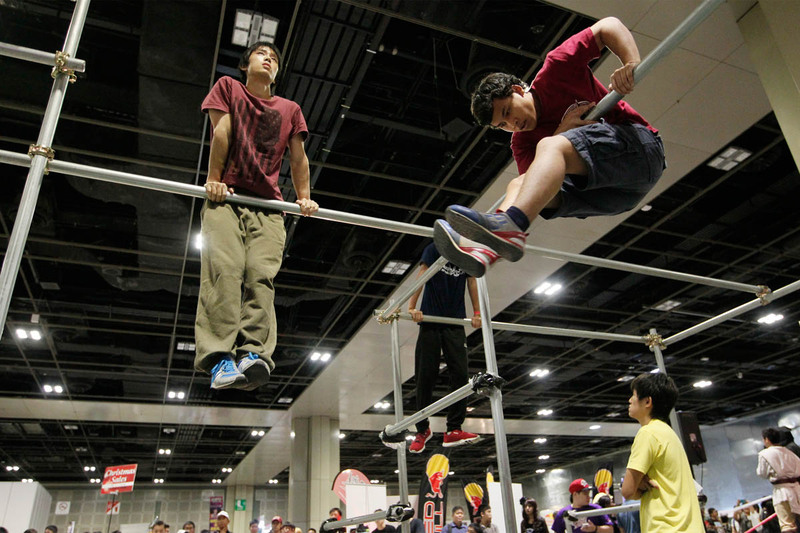 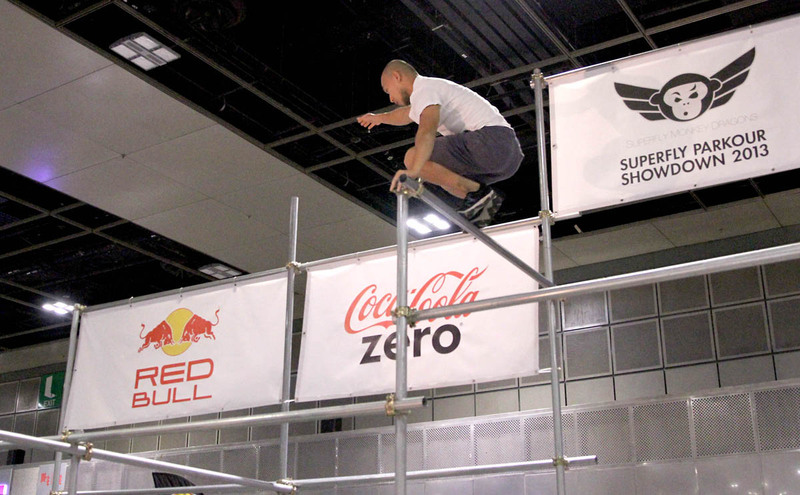 Of the 21 traceurs, or parkour practitioners, Filipino Jowenson Ian, 24, who once had a fear of heights, emerged the winner. 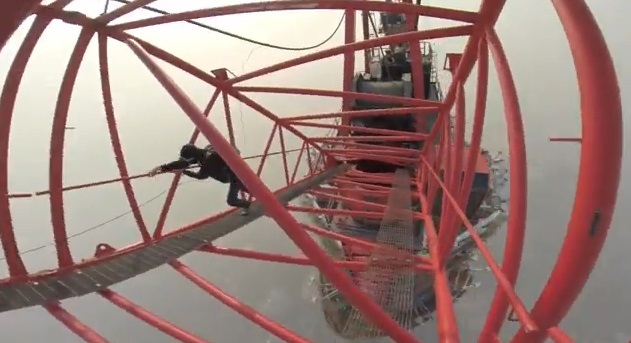 You wouldn't have known, seeing him effortlessly scale and leap off the top of a metre-high scaffolding. 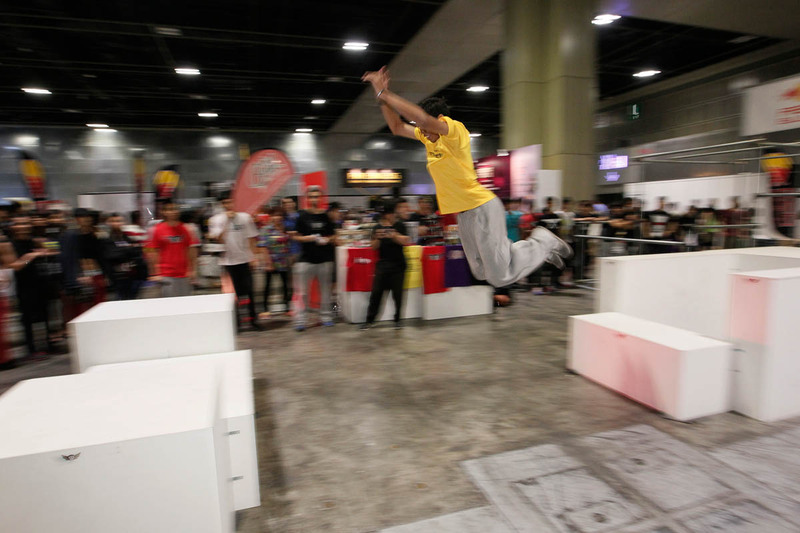 He beat his rivals from Singapore, Malaysia and Japan to clinch the title. 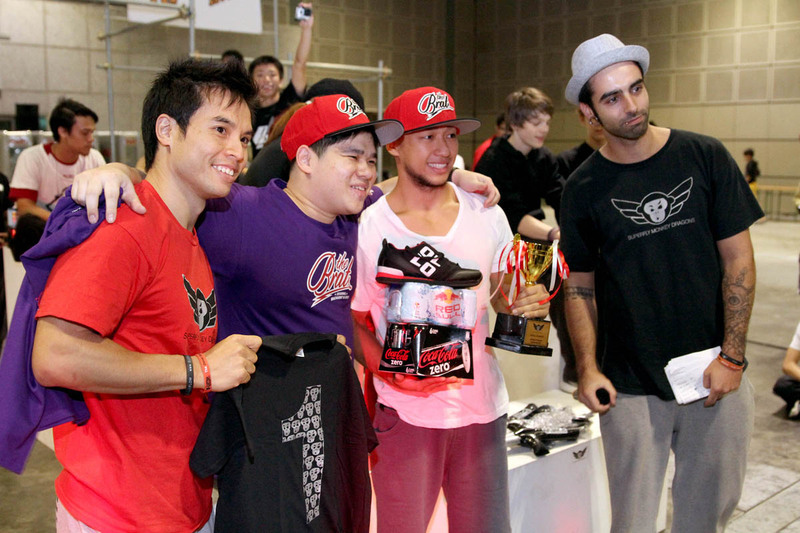 Mr Jowenson won a trophy, $100 worth of vouchers from The Brat restaurant, a pair of $99 parkour shoes and a six-pack each of Coke Zero and Red Bull. 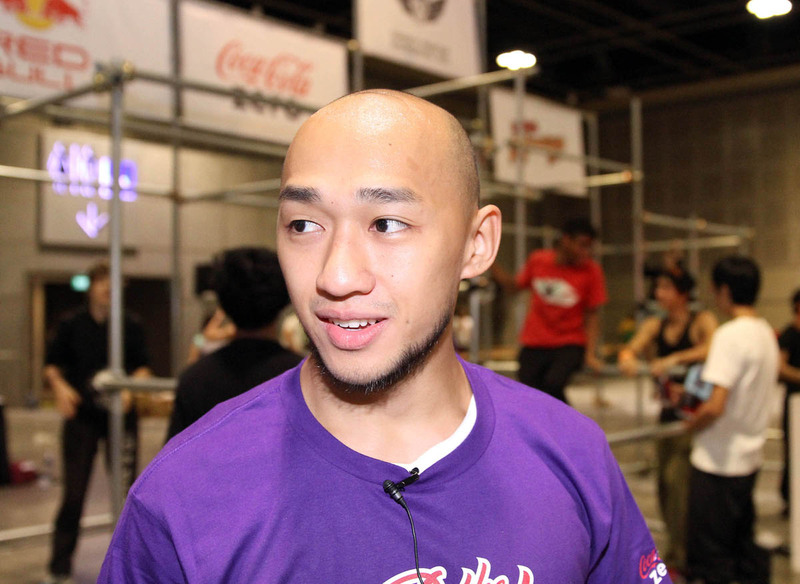 Mr Derrick Siu, a spokesperson from The Brat, Mr Jowenson and a judge of the competition. 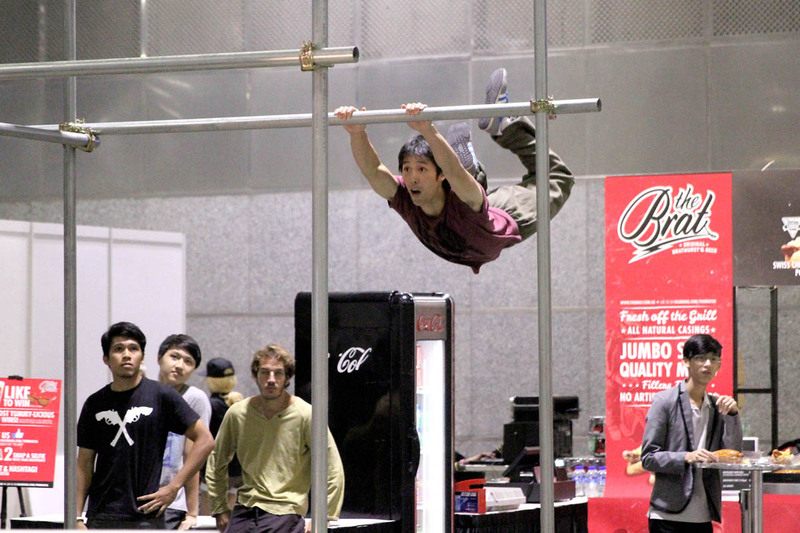 One of the competitors showcasing his skills.